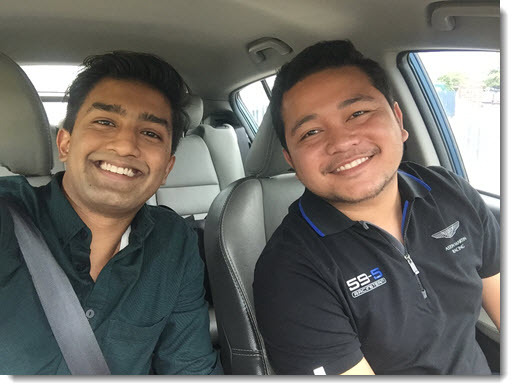 How to Become a Uber driver in Malaysia? –My 2017 Review. Uber started appearing in Malaysia 3 years ago back in January 2014 but I’ve never really bothered to try it out because I was busy with work and studies. It is not until my family started having problems with our finances that I started looking for another income source and that’s how I decided to try out Uber as a driver. Is it a good opportunity to go for? Definitely yes and I’ve even the proof to back me up so do continue reading this full Uber review of mine to know more about how Uber works and how you can earn from it. You get to earn cash fast. 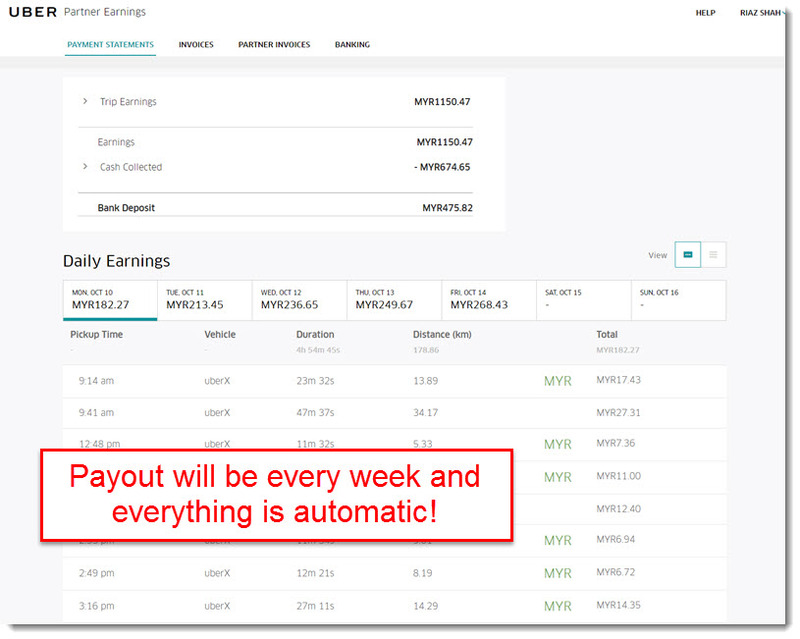 Payout is weekly so it’s useful if you are in urgent need of money. You can earn boosts on rush hours. You don’t have to worry about requests because you’ll get another one even before you finish sending a passenger. You don’t have to worry about tolls, they are covered within the payment itself. You’ll get to meet a lot of great people from various backgrounds to network with. You’ll get to meet celebrities if you’re lucky! Not a good job to go into full-time as it wears out your car and increases the mileage. You have to pay for your petrol. The Uber fee is 25% of your total earnings. Your car must not be more than 5 years old of make. If your car is older, you need to send them to the Uber HQ for inspection. Some passengers are dirty so you have to constantly clean your car every day. Many grumpy passengers especially in the city as they are always in a rush. How the Uber interface looks like. So How does Uber Work in Malaysia? –My Brief Intro. If you’re reading this page, I’m sure you’re more than interested to know how you can earn as a Uber driver rather than a passenger or rider. I know because like many other drivers I’ve met, I myself have only tried requesting Uber as a rider only 2 or 3 times before becoming a Uber driver. Not to show that we are greedy or anything, but it’s actually due to the fact that we have our own cars which is why we rather drive on our own than paying people to drive us around, so why not earn more to drive others as well right? Nevertheless, it’s good to know some general info on what is Uber and how it works. Uber is a ride-sharing app that helps us get from one place to another with ease by connecting riders and drivers with a touch of a button. Actually, it works pretty much the same in every country, but with a difference in pricing (More on that as we go). 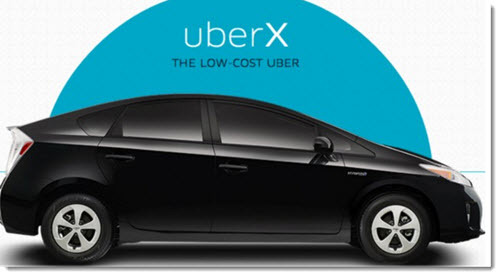 It’s actually very cheap compared to conventional taxis and it’s more comfortable too as Uber drivers use their own cars rather than taxis who do not really bother about their car condition as theirs are rented. Whenever a user requests for a ride, the Uber App will give the signal to the nearest Uber driver available so if you are forced to pick up a passenger 15 minutes away, it’s not your fault and you can actually give the passenger a call to see if he or she would rather wait for you that long or get another form of transportation instead (Very unlikely). And as a Uber driver, you don’t need to worry about directions because Uber will show you the way from its map if you’re not familiar with the area. Not comfortable with other map navigations? No worries! I usually switch to Waze for navigation as I’m more comfortable with it. Some other drivers use Google Maps so there’s no excuse for you not to try. Google search trend for Uber and Grab in 2016. What’s more awesome is that Uber is really going up right now as they are doing all sorts of promotions non-stop almost every week so if there’s a time for you to give it a try, there’s no better time than now. How do Uber Drivers Earn? – Know the Formula. There are 2 ways on how Uber drivers earn in – By driving passengers or by referring other people to join as drivers (Or both!). Referral incentives as of December 2016. It used to be 15 trips, then it went up to 30 and now, they’ve increased it to 49 trips which, I’m guessing they’ll be increasing it moreas usual sooner or later. 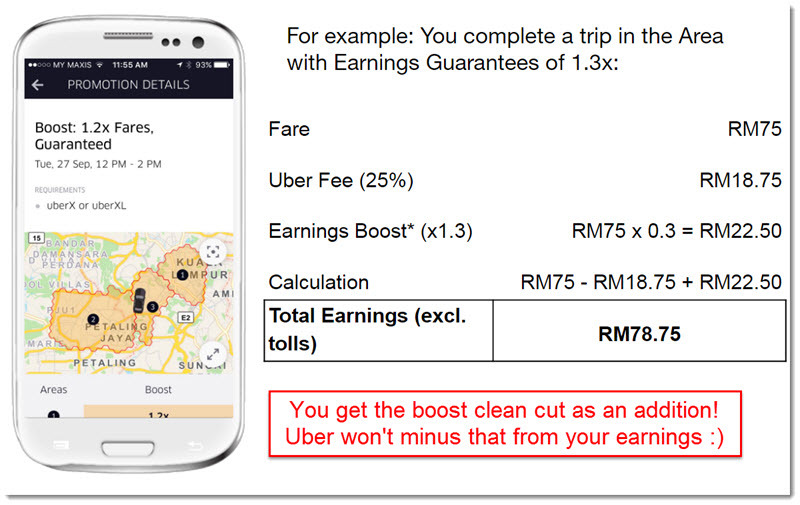 Uber calculation standard in Malaysia. You know how stingy big companies are the more money they have. So how do you earn as a Uber driver? When you first accept a Uber request from riders, you will instantly start the Uber meter with the RM0.95 as soon as you start the trip and as you drive, the per minute and per kilometer calculations will follow. It’s really simple and you don’t have to worry about anything else – I particularly just drive and not even think about calculating because often times, you’ll get too busy with Uber requests and your passengers will want to chat with you too so you have to focus on them. As a Uber driver, some of your passengers will pay by card while others will tend to pay you by cash. So if you’re holding cash, how does it work in the system? Every week, you will be getting your payment from Uber and everything will be calculated already. Uber will bank in and you’ll get emails like this. Uber will calculate the total accumulation of your trips for the entire week and from there, they will minus the amount of service fee from the total (25%) followed by the amount of cash you have on hand before banking in your account the remaining balance. And before you got to thinking, what if I get only card payments and no cash? Well if you do get it, then you’re one heck of a lucky guy but in my experience of driving, around 70% of Malaysians prefer to pay by cash as not many still prefer the use of cards which is a hasle because then I would have to park, calculate the cash and most of the time, it will take some time because riders tend to pay slow casing the other to wait behind you. Types of Uber Cars You Should Know Of – Which One are You? Uber X – The most basic of cars with 1.8 CC and below such as Viva, Myvi and even a Honda Insight (Which is what I’m driving). 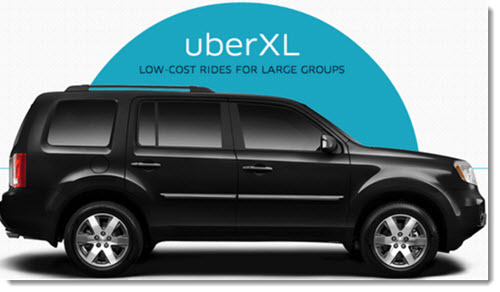 Uber XL – MPV type of vehicles which can carry up to 7 or 8 people. Typical cars I’ve come across includes Vellfire, Perodua Alza and Totoya Avanza. Uber Black – Premium cars with 2.0 CC and above like BMW and Perdana. 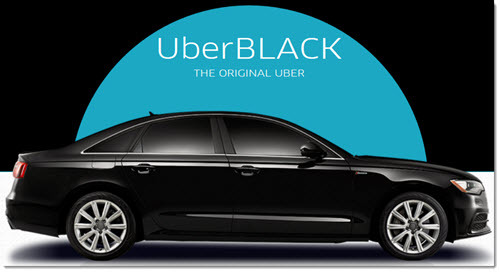 And if any of you are wondering, the idea of Uber first started out as a luxury ride-sharing service which is why Uber Black has a tagline “The Original Uber”. But because the company wanted to expand the business and cater to all types of people rather than focusing only on the rich, they started creating other categories so that everyone can ride no excuse. And before you say anything, No, Uber Black is not meant for black cars only. It’s only a name and any colour is fine. There’s another type called Uber Select which have luxury cars like Jaguar and Hummer but it’s not yet introduced in Malaysia mainly because the economy isn’t very stable here and living costs are just enough for us to pay bills and none for ourselves (Which is why driving Uber part-time is getting very popular). Calculations for all 3 Uber categories. As explained in the table above, the prices are inclusive of the base fare, the amount per minute and per km. One thing that sets me off a bit is the percentage Uber takes from Uber XL which is 28% while Uber X and Black both are only 25%. But I wouldn’t worry too much about this though, because one special part about being Uber XL is that you will be able to pick up Uber X passengers as well as Uber XL which means that you will have double the requests! You will have endless requests and you won’t have to drive long being idle, saving you a lot of fuel in the long-run. How Much do Uber Drivers Make in Malaysia? –My Best Score. If you’ve heard Uber drivers earning RM5,000 a month, even up to RM9,000 monthly, those are definitely true but only in gross total, not the clean profit. In reality, you have to think of your petrol costs, toll and car service. Minus those which will take about a quarter of your earnings and you’ll get your clean cut. From my experiences, the most I could earn a day if I drive 12 hours is RM300. So if I were to collect that much everyday for 30 days, I would definitely hit RM9,000 and a few of my friends are actually doing this. 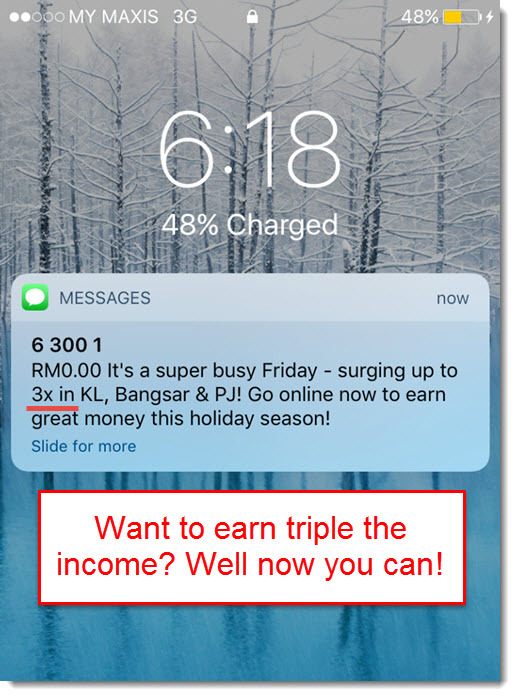 But on certain days where there are boosts up to double and triple the price, it’s possible to earn up to RM500 in one day. For me, I prefer driving part time because I also work full-time as an event planner so with the time I have, the best I can achieve is RM1,150 (You could definitely earn higher!) because I almost never drive on weekends and on weekdays, I only drive in the morning and evening where teh rush hours are. 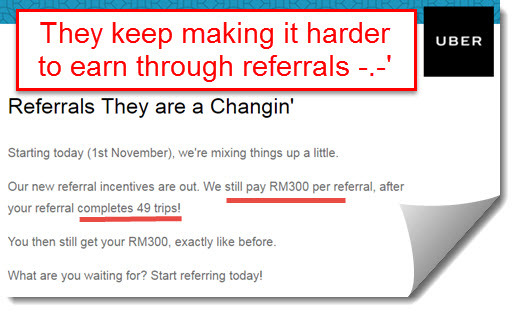 Driving part-time, I usually target somewhere around RM150-RM200 a day so every week, I try to collect RM1,000. So from RM1,000 in gross weekly that I collect, I spent RM200 on petrol and roughly RM80 on toll which gives me an average of RM720-RM800 clean profit because I tend to drive longer sometimes to earn more. How to Earn More Money in Uber? – Introducing the Surge! 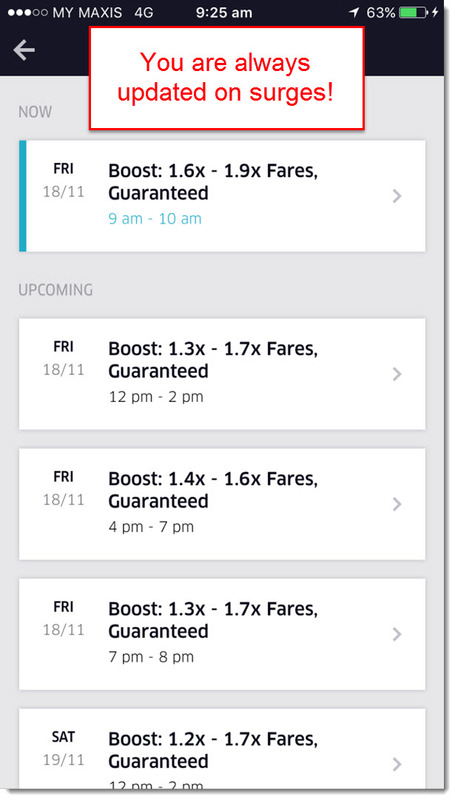 Uber stopped doing guarantee hours. What a relief! Previously, Uber have this thing called the guarantee hourly rate for rush hours. Meaning that for a set period amount of time from 10am-6pm, 12pm-2pm and 4pm-8pm, we will be guaranteed money if we drive within the hour supposing we drive around 2 passengers an hour. It was quite happening and in order to get all of those incentives, I wake up everyday around 5am just so that I can leave house before 6am to start Ubering. 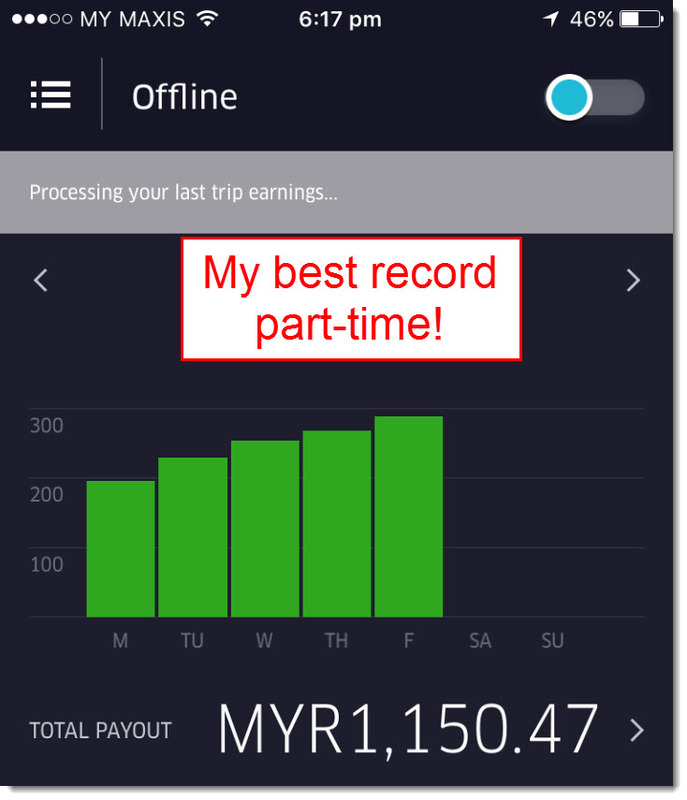 It was crazy and the hourly guarantee rate in the morning was RM30 per hour on weekdays so if I were to complete all 4 hours all the way until 10am, I could earn RM120 just like that! However there came a problem soon that many Uber drivers could not get the minimum required drive in order to reach the guarantee rates. Because in the morning, people who go to work with Uber sometimes tend to travel very far so the drive could sometimes take an hour or more like this passenger that I had from Shah Alam going to Melawati in KL. 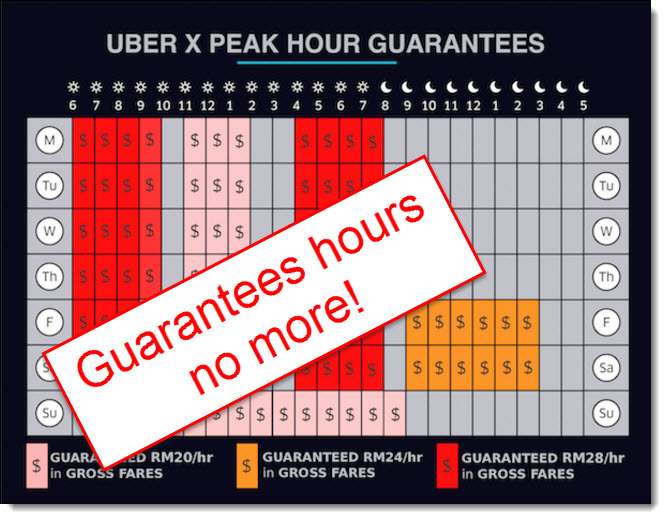 Because of that, not many drivers could reach the minimum 2 passengers per hour requirement so Uber decided to demolish the hourly guarantee entirely and introduced… The Surge pricing! The Surge is a new type of payment system whereby you don’t have to follow a fixed schedule anymore in order to get your bonuses – You just drive in rush hours in anytime you prefer and you’re good to go! In the morning people, are rushing to go to work so there’s a lot of requests non-stop so ready yourself before you head out because some distances are quite far – You’d be amazed how people can work like that if the distance from their houses are about an hour to 2 hours! Lunch hours i another surge time to go after but in my experiences, many passengers here will often go to short distance places like malls because they are chasing time so most of them are quite fussy. Evening is when people are rushing to go back home from work so you’ll have endless requests too and sometimes non-stop all the way till 11pm! (My favorite shift). 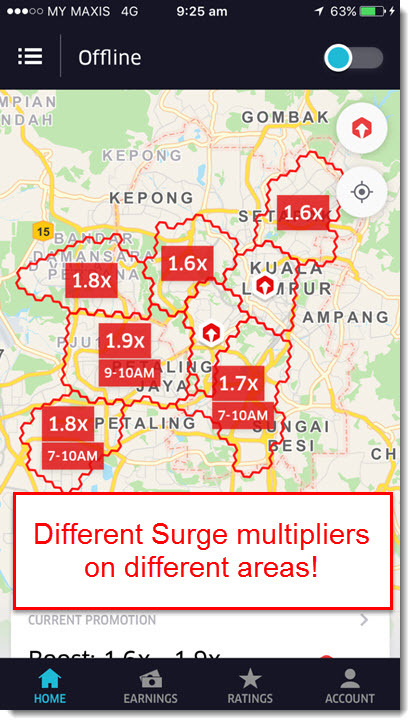 Have a look at the surge map I screenshot above – This will be your best friend because if you know the times and places, you can maximize your earnings and earn almost 2 times more! In fact, on certain days like celebrations and events, you can earn up to 3 times more! This is because on holidays like Christmas and New Year, people go out to celebrate so there won’t be enough drivers to go around and the same goes for events as well – Thousands of people visit a place in one day and not enough drivers to around. Like when Sunway Lagoon did a half price promo, it was extremely crowded that people come as far as from Seremban just to get on those surges. 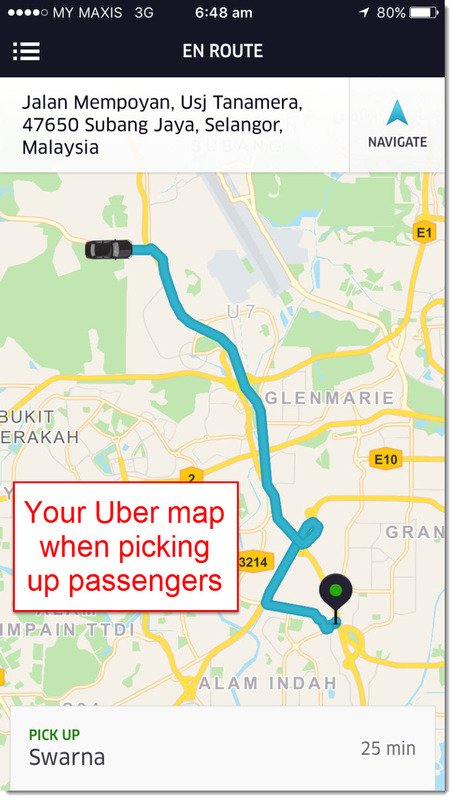 When it first started, the Uber surges are all in the capital city of Malaysia, Kuala Lumpur but now, some of the other states are also beginning to experience surges like in Penang and Johor Bahru. Whenever the clock reaches the rush hour periods, your Uber partner map will turn red indicating the areas where the surge is at. Synchronize your destination with people who want to go there! Within the red areas on the map, you will notice that there are different surge multipliers on different areas on the map and this is basically affected by the amount of people requesting Uber rides versus the amount of Uber drivers available. But don’t worry because if I were you, I would be more than happy to get any type of boost from anywhere at all because compared to our Uber driver friends outside of KL and Selangor like in Penang, they don’t have the luxury of having frequent and long surges yet. So what if you live in an area far from the surges? Introducing… the Uber destination set! See when using Uber, you cannot know where your passengers would want to go until you finally pick them up and start the trip. This is a tad annoying because sometimes just when we are about to make a final trip, we get a random passenger who wants to go somewhere very far like out of state up to Seremban (Happened to me 2 times!) and we have no choice but to accept. However with the recent update now, we can choose a location and Uber will synchronize the rider requests to match where we want to go – Makes our lives so much easier! For example, I live in Shah Alam where the sweet surges do not cover my area so what I usually do is that I set my destination all the way to Setapak from home and from there, as I drive I get a passenger who wants to either go there go somewhere nearby. This helps in productivity as we don’t need to go offline and drive all the way just to go online at a destination – Instead, we can go online anytime, set our destination and let Uber make our lives easier. Keep track of the surge times! So how do you stay up-to-date with surges? Easy! With the recent update, all the bonuses will be saved in your phone so you won’t have to worry at all about checking your email while you drive as how I did last time when I first started. The best surges are always on weekdays when most of the people go out for work and meetings because there are a lot of money to be made there. I personally would like to stay at home on weekends and spend time with my family because on weekdays, I work early morning and usually reach home around 10 just in time to refresh and sleep. And because I work as an event planner, most of my work are always on weekends to manage the event there so I rarely have weekends to myself, probably once or twice a month only. But starting from lunch time, a lot of people will go out and you’ll have plenty of requests the whole day and if you’re driving till night, the nightlife areas like Bukit Bintang has some very cool surges too. I remember driving some someone from Bukit Bintang to Sunway Pyramid midnight for 15 minutes and I managed to collect RM35. Uber Service Area Map –Knowing the Locations. Uber core service areas around Klang Valley! As for the surge areas, you would have already known that it’s busiest in cities and central areas like malls and business parks where people are in need of fast transport as they want to avoid the hassle of driving on their own. Besides the obvious KL as the hotspot for uber requests, other cities and states like Penang and Johor also has surges too. How does the Boost Work? -Uber Surge Pricing Explained. The best thing about surges is not just the flexibility of driving on whichever time you prefer within the rush hour period, but actually the bonuses you’ll get during the multipliers. So what do I mean by multipliers? The surge boost is all yours to keep. 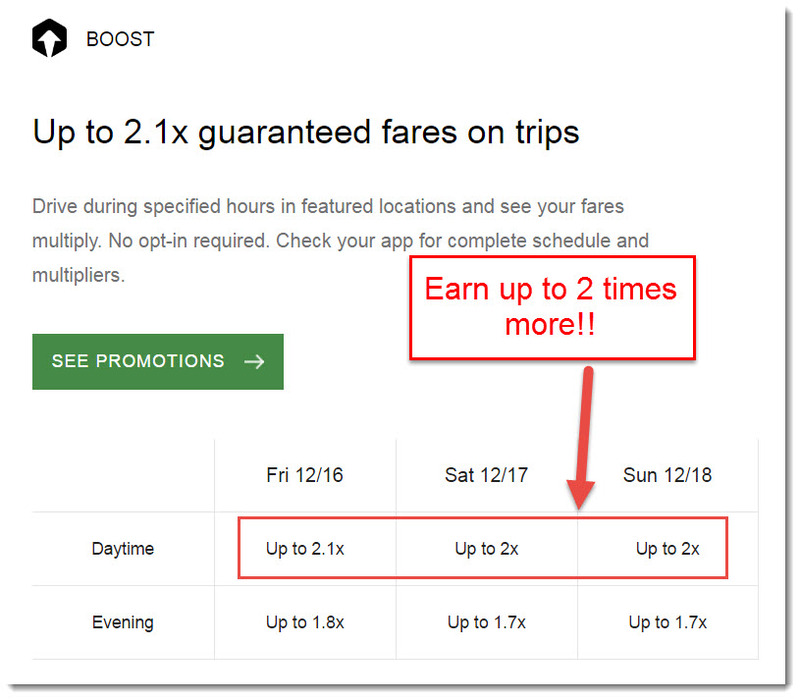 A multiplier (Also known as boost) is the bonus incentive you’ll get on certain areas whenever the surge is on. It’s one of the best ways to get additional income because the amount you get from the multiplier is for your own and Uber won’t touch that. As seen from the calculation above, Uber has a fee of 25% of every transaction so supposing you collect RM100, they will minus RM25 from the total you’ve collected. But if you were to position yourself when the surge is 2x more, then that means you’ll get RM200 correct? And Uber will still only minus RM25 instead of RM50 because the extra RM100 you earn is from the surge! That picture above is a screenshot of an email I got for an upcoming surge on the weekend. On weekends, there are handsome boosts such as those because not many people want to work because we want to spend time with our families. Because of the lack of drivers versus the high amount of requests from riders, the surges often go up so you can definitely be sure that surges shoot up even more in times of public holidays or celebrations. Maintaining your Ratings – Do you have a maintain status as a driver? If you’ve heard of drivers saying that they meet very rude passengers, that is actually true but only if you are rude to them. If you keep your car clean, converse nicely with the guests or give them some mint or two, they would definitely give you a good rating. If your car is dirty, smells of cigarette and you raise your voice to your passengers, then they would definitely give you a bad rating. Good ratings don’t really matter. The Uber driver minimum rating requirement is 4.6 so if you were to fall below that, would get penalized and your account blocked. But don’t worry though, that just means that you need to go see the management to clear it up and they’ll be asking you a few questions on why is that so to help you get better. Also, if you’re thinking of being the “perfect” driver and try to hit 5 Star ratings… don’t be. It’s pointless and there’s no benefits whatsoever, no incentives, no money. My best score was 4.95 but all I got was a message saying the “community thanks you” instead of any proper rewards (Uber can be so stingy at times). So whatever you do, it’s best to keep on driving and not worry about getting the best rating because at the end of the day, it’s all about driving to earn a living for yourself. As Ed Sheeran once said, “I can’t tell you the key to success but the key to failure is trying to please everyone. Uber Driver Requirements – Checking if You’re Fit. 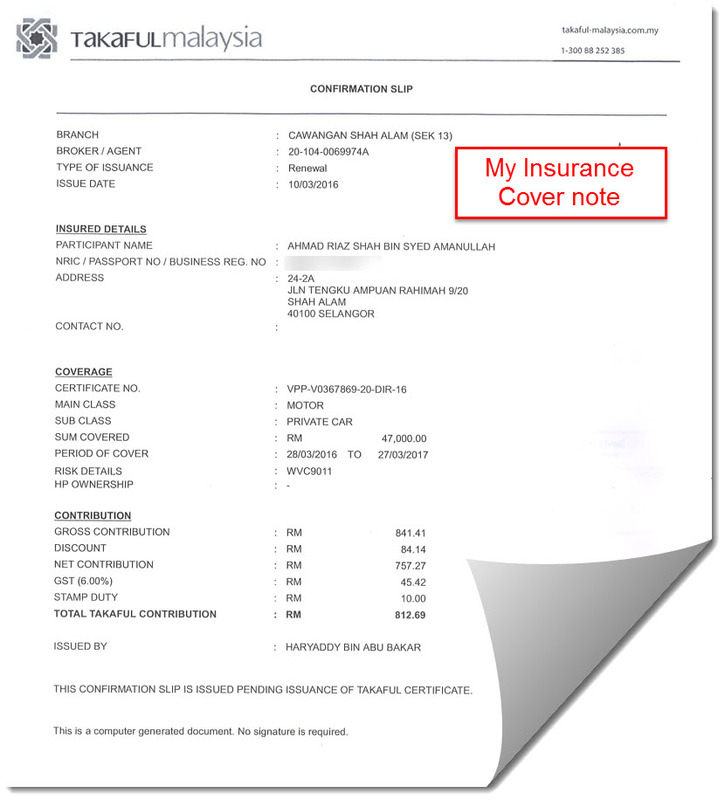 How an insurance cover note looks like. If you’re curious on what an insurance cover note is, I scanned mine to help you get an idea of how it usually looks like above. Basically you don’t even need to own a car to become a Uber driver, you just need your name on the insurance letter which means that it doesn’t matter who’s car you use – Your mom’s car, or your friend’s one which I find pretty flexible. Also, nationalities are specific to their country of origins only which means that in Malaysia, only Malaysians can become a Uber driver and in the France, only the French can. As for the car requirements, they put the maximum of 5 year old but due to the shortage of drivers versus the immensely high demand of requests (Uber does a lot of promotions), they can be quite flexible. I’ve seen Uber drivers with an 8 year old car driving around, it’s definitely possible just that you may need to go their office for inspections – Keep your car clean and if it’s in a very good shape, you’ll definitely get their green light easy! So then you might be wondering, do Uber drivers have insurance? The answer to that my friend, is definitely no. If Uber were to give the drivers their company insurance cover, that means we will all be labelled as employees which is a hassle of Uber since they will then have to give medical coverage, payslips, and other stuff that normal employees have. That is why we drivers are labelled as Uber “Partners” because they want to emphasize that we are not employees and that we are driving under our own risks which is okay I guess since we have the flexibility of starting whenever we want. Getting Started – How to Sign Up and Get the Bonus. To get started, the first step is the easiest which is to sign up online. Now there are 2 options to this – One is to sign up through the main Uber website, or the other option is to sign-up through a referral (Here’s my link). If you sign up from the main Uber website, you won’t get any bonuses whatsoever but if you sign up from my link, you’ll get a bonus and it’s usually in the form of cash guarantee. It’s not a direct cash money though, it’s in a form of guarantee or an incentive boost in order to reach their set goal for you. The welcome rewards keep changing so I’m not sure what their latest update is as they do not have a specific list on the welcome bonus updates – you’ll get a notification after you’ve joined. Initially, it was cash top-up but after the recent update on the surges, you’ll more than likely to get an incentive boost to help you earn more handsomely – Either way, just keep driving and you’ll be notified by Uber. After you’ve signed-up online, all you need to do next is to wait for a text from Uber. This will take somewhere between 3-5 days and when you do get the text, they will ask you to head over to the nearest branch as seen on the screenshot from step #1. Once you’ve received the text saying that you need to head over to the nearest branch, you now need to head over there with the documents I’ve mentioned before – The IC Photostat, insurance cover note, as well as your driving license copy. Having your car grant copy with you will also help as sometimes the officers there might want to have a closer look (It happened to me maybe because I’m driving a Honda). Location of the Uber activation sites around Klang Valley. If you’re wondering where the Uber locations near me are, you could check out the full list here. Also, bear in mind that these locations (Except for PJCT Industrial Zone) are all very small office rooms which is often shared with another company and can only go in after you’ve received a text from Uber to go there. They are called “activation sites” because you go there just to hand over your documents and hear the briefing so Uber took up the initiative to rent one room within a certain company’s building to make it easier for you to go there and keep their costs at a minimum so if you’re wondering, no it’s not a Uber office. Their main office is in the PJCT Industrial Zone so if anything, that’s where you want to be. Having Trouble Contacting Uber? –Here’s How to Reach Out. 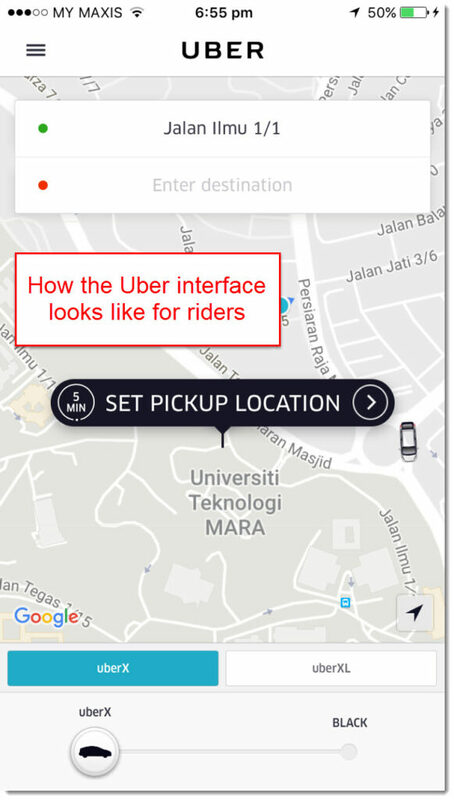 One of the most common questions I get is how to contact Uber in Malaysia? (I presume any other countries elsewhere might be facing this issue as well). You go the Uber website, you can’t seem to find the phone number and when you want to email them, there’s no email address to begin with. So how do you reach out to them? Initially, I talk to their representatives via their “support [at] uber [dot] com” email address and they reply quite fast too. 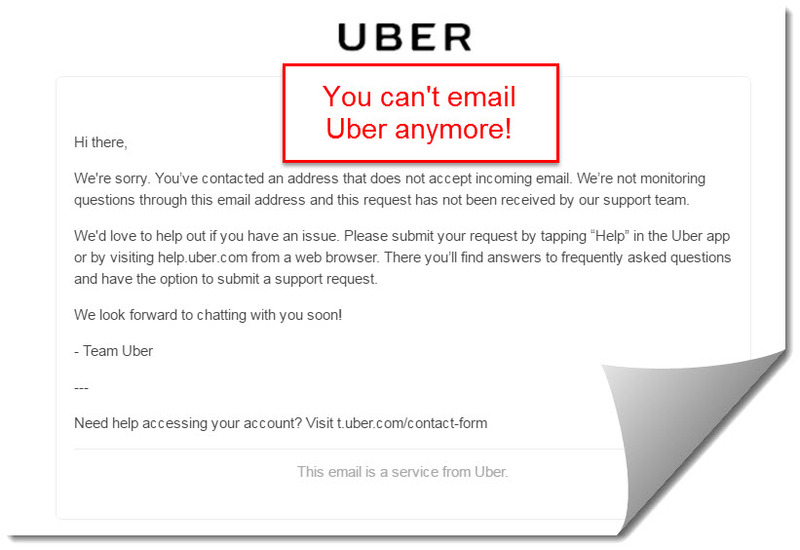 This is because starting from December 2016, Uber stopped incoming emails anymore which means that you cannot email them anymore, but they can email you instead. Now, you’ve left with 2 options – Through their app, or by calling them. The main part their they focus on is the Uber app support which they tend to reply you almost instantly as many drivers tend prefer settling issues through there instead as they are already on the app most of the time. 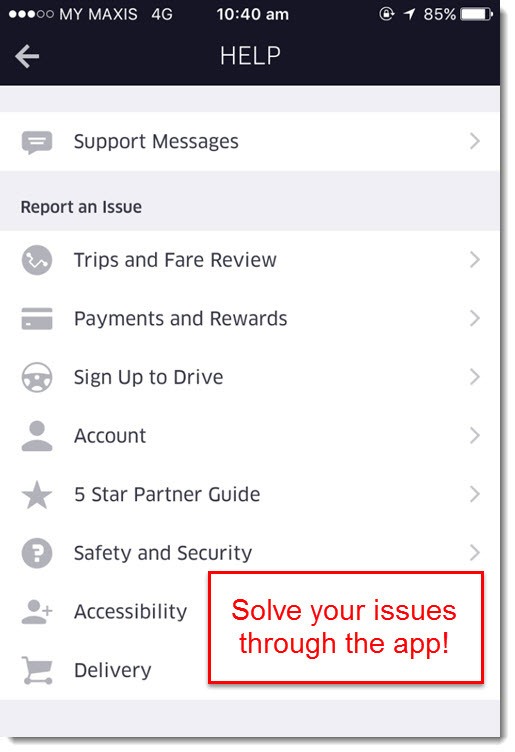 From the Uber app, you can access the support from the Help tab where you can report on issues there. There are 2 different apps for Uber – the Uber partner app and the rider app. Don’t worry about the rider app though, it is the main app you’ll find on the app store or Google Play – The driver app on the other hand, is hidden and can only be accessed when you go to their activation sites when joining. 6, Jalan 51/225a, PJCT Industrial Zone, Seksyen 51a, 46100 Petaling Jaya, Selangor. Bear in mind that the contact number is not meant for riders – Instead, it’s meant only for Uber drivers. The general line is for any questions or issues you might face while driving, they answer on the spot without any holds or transfers because it’s meant to help drivers settle disputes while driving. Note that they also open 9am-6pm on normal operation hours. The emergency line on the other hand, is only meant for accidents whereby Uber will help guide you on what you need to do. I got you covered brah – Introducing the Greenlight Hub! 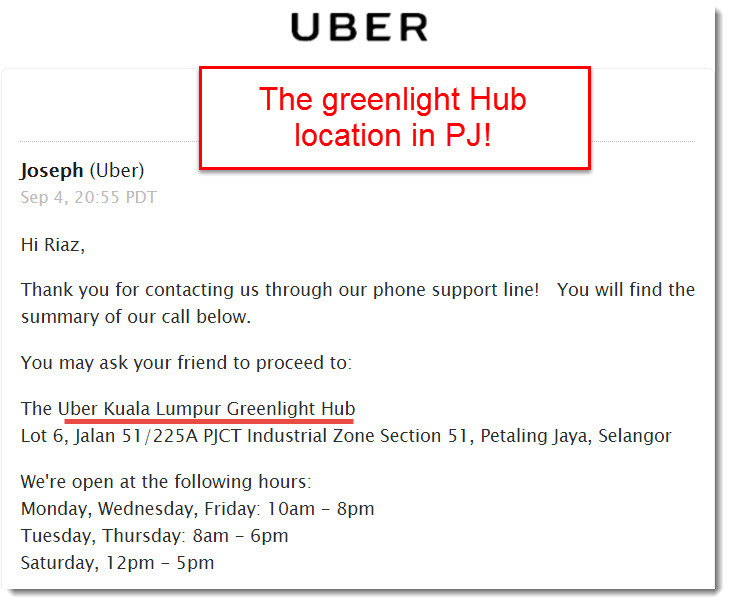 So what is the Uber Greenlight Hub? It’s basically their main office in PJ where they do their vehicle inspections and any other Uber activities that the activation sites can – I asked them if they do car-leasing or have a collaboration with a company that does and they said that everything is at the Hub. Basically you go there and see what car fits you but you have to pay monthly for it since you’ll basically be renting a car from them. Anggun Rent a Car – Based in KL, but price is bargainable. Maha Simfoni Sdn Bhd – Based in Shah Alam. Mudah – They have some affordable rates here too. The ranging of long-term car rental is usually around RM40 per day which is about RM1,200 a month but if you can find one at a lower price, please do share your knowledge here as well so we can help others save more. Another alternative you could use is renting from students who are just starting out the car rental business as they tend to be much cheaper and the price is also bargainable. Also, if you drive around housing areas where you see cars which are just parked there long-term and people rarely use it, you could go and visit their houses and strike a deal with the owner so that you could use their car and pay them monthly as royalty. Is Uber Legal in Malaysia? It’s more legal now than in ever. As of September 2016, Khazanah Nasional Bhd bought a stake in Uber. For those of you are do not know about Khazanah, they are a huge organization which controls the sovereign wealth fund of the government here in Malaysia. 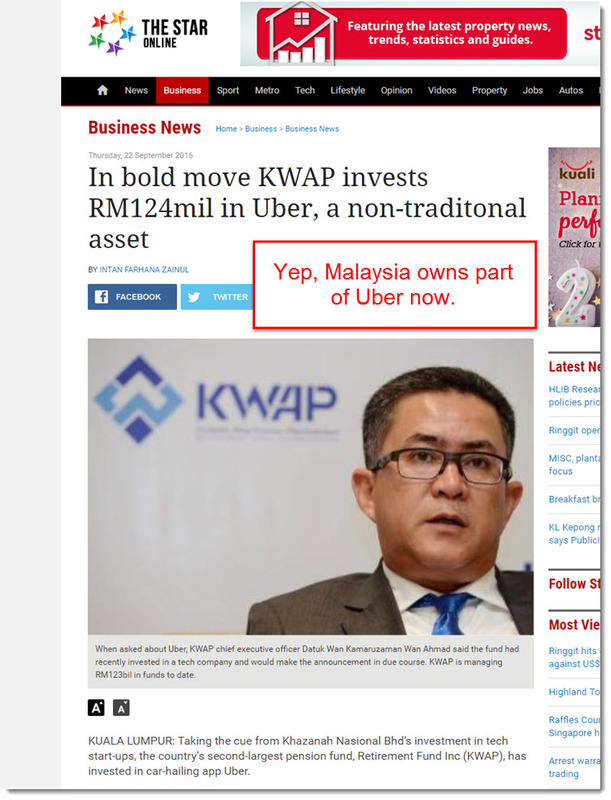 They invested $30 million for their share so seeing that the government controls part of Uber, the question of whether or not Malaysia legalize uber has definitely been answered. So what does SPAD (Malaysian Land Public Transport Commission) have to say about this? From the New Staits Times Malaysia. I’m happy to say that for the case of SPAD Uber Malaysia, it’s definitely legal here starting last year in 2016 because they want to level out the playing field with the pirate taxi drivers who control the market. 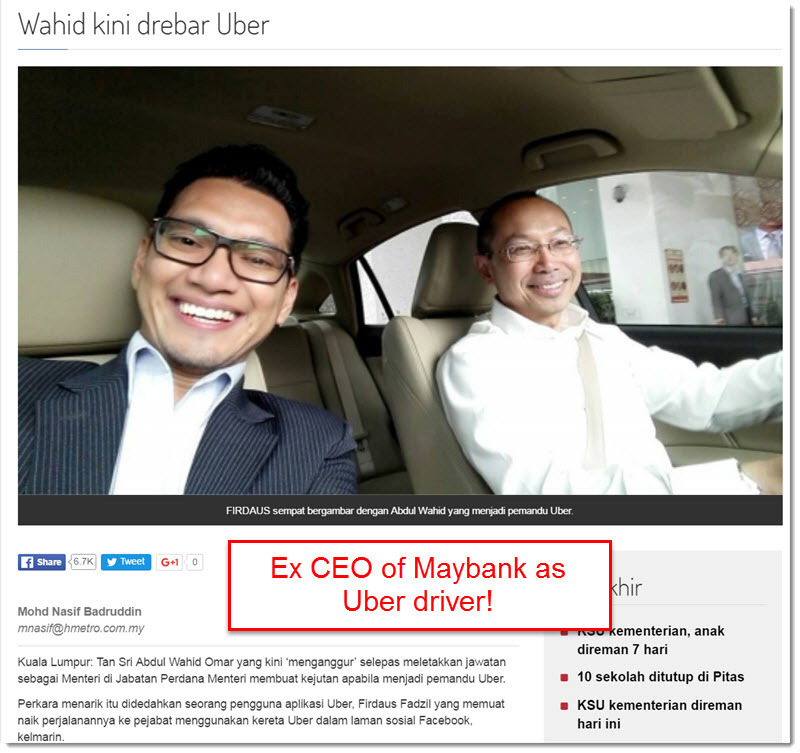 Even Tan Sri Wahid Omar, the ex CEO of Maybank drives Uber and he is a very well respected man was also the previous CEO of Telekom Malaysia back then. A lot of people are taking the initiative to drive Uber because of the rising living costs in Malaysia and no matter what level of society you are, everyone can drive. I get a lot of people asking is Uber banned in Malasyia or not because in certain countries, the government prefer taxi drivers instead. In fact, in the Eastern part of Malaysia, the Borneo island of Sabah and Sarawak, Uber is not yet established there because the mister still prefers taxi drivers there instead so not all areas are well-received yet. Enjoy your Uber Journey! – Some of My Encounters. On your first drive, you’ll definitely be very nervous. But trust me, after two or three drives you’ll definitely be getting the hang of it and after a week, you won’t even feel the nervousness any longer. This one’s a picture of my with some cool Egyptian teens who I picked up at Skytrex Shah Alam. And here’s me with Faisal, a pilot from Malindo Airlines. Some kids I picked up at a badminton court in Setapak. These kids were from Help University and they liked me so much, I ended up planning an event with them. I was surprised how nice Japanese people are. I met Akira in Bangsar and we still keep in touch until now. Have you ever met a Malay man who wasn’t born in Malaysia but is curious in learning his own culture? I forgot his name I met this guy at Nu Sentral and his destination was Bangsar Village. This guy is pure Malay but he was born in Sri Lanka from a minute Malay colony so he doesn’t speak Malay but he wants to learn more about himself and his origins. I had a great chat with him about our country and what’s happening now and before. This guy was from North Pakistan, he had yellow eyes! Funny story on this Pakistan guy. I said sure! And as I drive, the song he chose was Janam Janam – sang by Shahrukh Khan. He made my day ?. Don’t be fooled by his looks, this guy with the blonde hair is actually an Instafamous and he’s got 96k followers! I met Harry in Jalan P Ramlee KL and he asked me if I wanted to be viral. Jim is the sister of the famous Malay celebrity Alif Satar and I met her at Publika after she finished work. 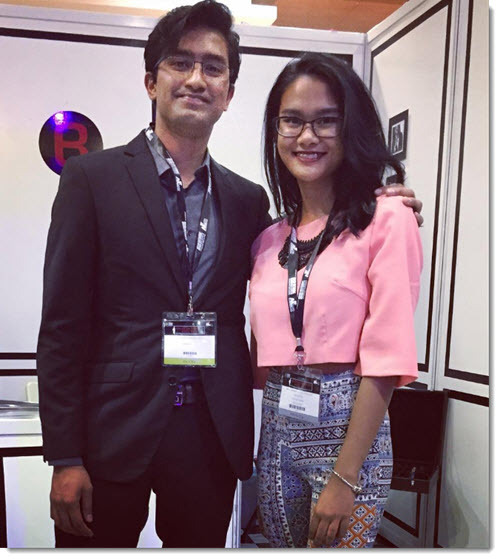 I was quite surprised that she was working with her uncle, Bon Zainal because I know him as I’ve worked with him previously at a fashion show here in Malaysia. 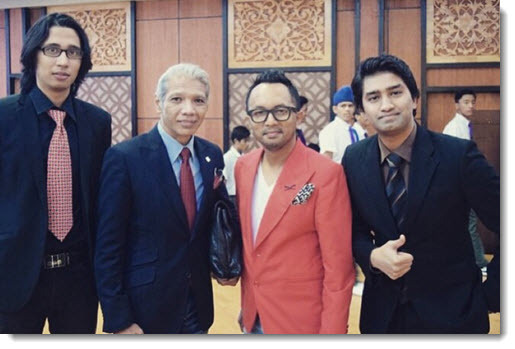 A picture of me with Bon Zainal. In case you didn’t know, Bon is one of Malaysia’s top designers and I was quite surprised as to how humble their whole family is that I still keep in touch with until now. An Uber or A Uber? –That is the Real Question. The correct pronunciation is actually “a Uber driver”, that meaning “Yoo-ber” as it starts with a “Y” instead of “U” – Its kinda like saying “University”, “Uniqlo” or even ”Utopia”. It’s NOT pronounced as “Oober” vowel-wise but in my defense, it varies from country to country. Americans and French prefer to call it as a vowel but in the UK, Singapore and here Malaysia, we pronounce it otherwise. It’s a minor detail but somehow 5 out of 10 of my passengers keep asking me the same questions again and again so I figured that I should put it out there for all to read. So how do you pronounce it in your country? I’d love to hear about them down below! Phew! This is by far the longest review I have ever written and its 6,000 words! Last but not least, bear in mind that Uber pays weekly every Tuesday so use that info to time your drive hours carefully. You are bringing the image of an international company so dress nice, clean your car and drive carefully! Personally, I think 25% is quite a high fee they’re taking in the long-run but other than that, Uber is great in terms of navigation, app functionality and as a side income job which is why I gave it a rating of 4.5 out of 5. That’s it! Thank you for reading, you guys are awesome and as always, share your thoughts below if you have any as I would love to hear them out! 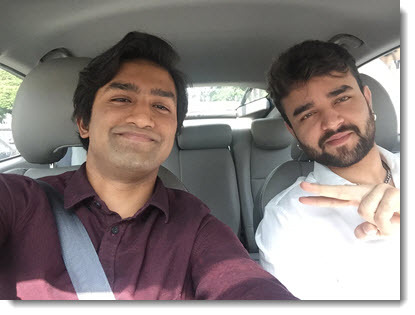 Driving for uber is one of the best job if you are choosing it as a part time job. It is not for full time job you can earn a lot it depends on your working hour and speed you manage between. The most important is that how much older is your car it should not get high maintenance services. Definitely Darryl, getting to know which workshop gives you the best deal and service also helps in the long run too because they are a lot cheaper. Bro please share your whatsap contact detail. I want to discuss and get some more information regarding uber. Wassalam Ali, apologies. 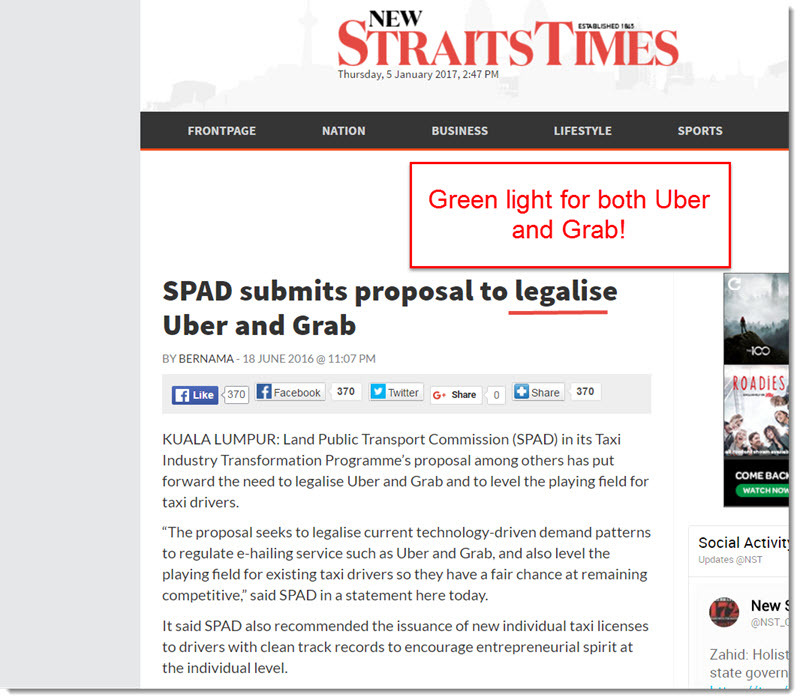 As mentioned in the article, only locals can be uber/grab divers. Was reading thru your page & found it to be very useful. Am planning to drive part time for Uber. You did mention that they have rentals to use? I wanted to try out using rentals first before using my own car. Any thoughts on using rental vs own car for Uber? Actually using your own car will save you so much more money than using a rented car. Rented car usually cost about RM1,000 – RM1,800 a month which means you will have to chase after sales each day to make up for that. If you have your own car, it’s best if you use that. What Network you using for uber? 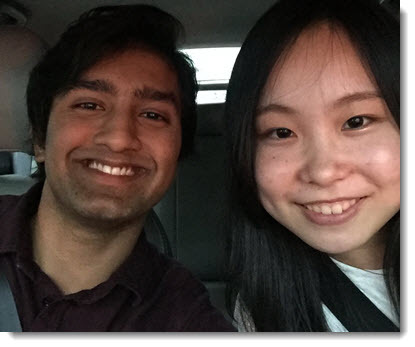 can you please guide me about how international student can become uber driver? Thanks for the comprehensive review and it has addressed most of my uncertainties before starting out as a Uber driver soon. I have a few more matters which i am still uncertain. Hope you can help to clarify. 1 How do we receive payment by credit card on the spot if the passenger has not registered his card in his ac ? 2 If the order is a long distance trip such as to airport, Genting or outstation towns, wouldn’t it very unprofitable as passenger pays for only 1 way trip. Would we be able to see the passenger’s destination before deciding to pick up the order. I read somewhere that if you send a passenger to KLIA you can actually hang around and and there’s a queue system by Uber to wait for your turn if you think its worth it, just like how the airport taxis system. Otherwise it will be an empty trip back or to detour to neighboring putrajaya or cyberjaya hopefully able to pick up potential orders. 3..Based on your experience what is the average % of petrol cost over the gross income earned. 1. Customers will either have an option of paying by card or cash. If by card, he will need to register first so don’t worry. 2. Not exactly. Before you head back to either your home or the city, make sure you maintain Online as you’ll get more customers along the way from nearby cities. I usually get from Cyberjaya on the way back from KLIA. 3. Please read the review, I earn RM1,500 roughly a week and I only fill petrol around 3 times which I have mentioned there. 4. Again, please read through my review before asking. Toll is included. I have started driving for a week. Still trying to get the hang of it. I noticed in my trip earning details the Uber fee is calculated upon total fare including surge amount. 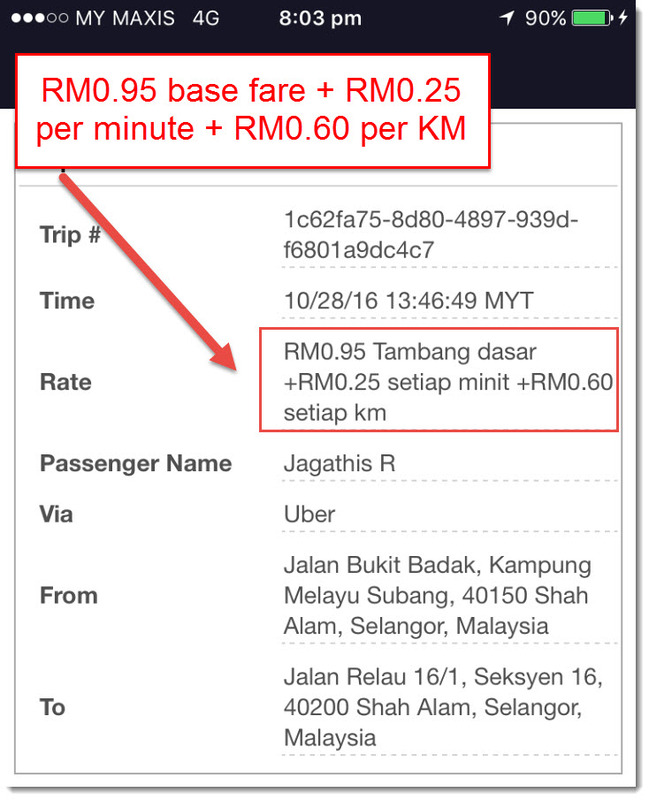 Your write up mentioned that the fee is only on the basic fare not including surge amount. Was there a change in policy by Uber since your write up ? Another thing is while on a current trip there will many requests coming into the screen non stop especially in the city. Being new i will usually not accept until i have almost reached current drop off destination. As such, my acceptance rate statistic is very low at only 15%. Is this normal ? Awesome to hear that you’ve started driving! Yup I did mention that the fee is only on the basic fare and they won’t touch the surge amount because it varies. It’s in their policy too, I suggest you get in touch with Uber’s support though on that one because maybe they’ve changed it along with the updates. However they do have some major updates which give drivers more plus points on earning – One I particularly like is the new Goal system whereby if you manage to reach like a 100 pickups within their specified time-frame, you could earn an extra RM100 or RM200 which is pretty cool. About the new requests that you keep getting while driving, I too experienced the same thing as you. Uber will count those too so if you didn’t pick that request up, it’ll definitely affect your acceptance rate. I would suggest you to just tap on that upcoming requests though, because it’s easy money and 90% of the time it’s at the same place. For example. while I was dropping someone at KL Sentral, the incoming request I got was also at KL Sentral too so you can save up on a lot on fuel. Most of the time it’s at malls and Residences like KLCC, Sunway Pyramid, or even Suriamas. im gonna register using the refferal links? do you encounter some customer don’t pay o not enough money o told u they will asked money from friends but never return how u solve it? Sometimes Rony, just call Uber and they will reimburse you. how u start a conversation with the rider when u pick up the first customer do u nervous excite? I want to ask I’m foreign,can i become a uber driver in malaysia? Hello,any thanks and appreciation for posting this detailed review and guide to being an Uber driver. If you can do a sequel to this article but on GrabCar it would be awesome ! Question: what happens if you pick up a passenger and he/she wants to go out of town? Genting may still be acceptable but if the passenger requests to go to Melaka or Johor, it might be difficult. If you pick up a passenger and send them out of town, there’s no other way but to go on and send them but before anything, it’s best to be frank with them and let them know if you are willing or not. Personally, though I think the Uber management should give out a choice for drivers before they accept so as to avoid unnecessary cancelling by certain drivers. Hi Riaz, I want to ask about fares. You know when we are somewhere else dropping off current customer, and then suddenly another new request is coming and it’s gonna takes about 20 minutes to pick up that new rider, for me it’s quite far. So I’m just curious, do the fares covers those 20 minutes pick up trip as well? Hey Hani, good question! I actually asked that myself when I was just starting and No, the time counts as normal, it does not stop at all so you have to continue driving as the timer still runs as usual. Hope that helps! Great post. I did my first uber drive yesterday. Tot of giving a shot since I have extra time and great way to meet new people.. but it’s unfortunate within 6 hours online I only received 3 req. I’m under black category. Called the reps to check if I can downgrade to x but was denied ? Any tips? Actually, you can ask Uber to switch from Uber Black to Uber X. Me and my friends do it a lot here and you can actually request to combine requests from X and Black as well. You need to go to their office for this one. I have complete the sign up process last friday and still waiting for the approval until now (monday). As for the document they required its has been review and was on “active” status. Im wondering how long it will take to get the approval from uber so that I can “go online” for uber? My location was in Kota Kinabalu, Sabah and I didnt know any nearest uber partner support centre around here. Thank you sir. i just signed up 2 days ago thru the Uber Driver App waiting for the message of notification. at the same time wondering where to find more in depth details of being a uber driver. your review clears out most of my questions. Glad I could help Steevan, good luck in your first drive! Hi Riaz, the article was wonderful. Well, in my case, I’m driving a 2006 Perodua Myvi, clean and neat, performance are pretty smooth as well. Is it even possible to get accepted? Hey Andre, great but you’ll have to contact Uber first to do a checkup as it’s more than 15 yeas old and your car is actually more than 10. Just new to Uber, how can i notification about the surge price like you do? How does the surge works? Do we have to turn it on automatically? Hi Riaz, Thanks for all the helpful info. Yes, I did. I used 2 different phones because believe me, when you start driving, everything happens so fast. One time you’re talking to your passenger, suddenly you get an incoming request before you even arrive and at the same time, you get a request from Grab. And if your passenger wanted to pay by cash, you will rush trying to count the money and worse, if you are in a place where you can’t wait long like when you are at a dropoff point and the guards keep asking you to move. Your mind will be so messed up so it’s easier and more productive to have 2 separate phones. I would also advise you to drive at least for a week to get used to everything before you start adding Grab as well. Hope that helps! 1) If uber driver take the fares from passenger, how does uber deduct their shares? 2) Is the uber driver only visible in the Apps after they sign-in? 3) Uber Apps recognized Uber driver by tel number or user name or email address? This is because if the Apps only recognized driver by telephone number, if the telephone number change, do I need to register again? 1) As I’ve mentioned above, Uber takes 25% of the total amount. But you don’t have to worry about this, everything is calculated already by Uber on the app. 2) Yes. In the app, you can go offline and online. When you’re online, only then can your passengers see your profile. 3) By all three. You can just inform Uber if you change your number. I want to sign up as a driver for Uber using your link. What kind of bonus will I get? Hi Riaz…your article has been really informative and appreciate the amount of effort that has been put into it.. I am interested to know what made you choose Uber over Grab ? Yes, it’s possible to do that Dennis. Many people prefer X because of the high demand but to get the integration, you will need to contact Uber support for that. You can do that from either your app or by the Uber partner support line 03-92122575 . Hope that helps! Hi Riaz Shah. I really wanted to be an Uber driver. But my driving license is still P. Would that be a problem? Salam Akif, I just called Uber and they said that you need to finish your P license first before applying. This is because the gov has been very strict and they wanted to take extra precautions to protect their image. Do have a go when you’ve finished, it’s actually quite fun! Reading it just making me excited to start doing Uber. I have just signed up from a referral and waiting for activation. I am mix in my emotion of being panicky, excited and omg maybe too anxious staring at the map just so i do not MISS A TURN!!!! LOL!! What will even happen…if we took the wrong route?? Hope i dont turn up the phone speaker too loud that my navigator start saying “finding for navigation” …. i might soak in my own embarrassment… Im thinking too much… unless if im familiar with that area i would be OK…. Awesome to hear that Shannon! If you accidentally took the wrong route, your passenger will definitely be a bit angry but if you’re not sure of the route, you can let them know at the beginning that you’re not familiar and that you’re just using Waze. They would understand and in my experience, some of them would even show you they way! Just treat everyone as friends and they would treat you the same. It doesn’t matter if you on speaker or not, I actually did that myself and the passengers like it too because if Waze shows a different route, they would let you know and show you their own shortcuts instead. Thanks for a really interesting post. It is useful to anyone looking to use driving for Uber as an additional income stream. Although I am not based in Malaysia, I found the informative content and details, including the pros and cons, relevant to me and I may consider doing this in the future. Anytime, Fran! Good to hear that, it’ll be an awesome experience for you. Thanks for dropping by! seriously bro you should be a consultant for Uber themselves. You can do a lot for this with this skill and they will be happy to pay you for this sort of ground breaking research work. The most important part of this article is that it is real time hence nothing is missing. I like to honesty and simplicity in it. This is what audience want. Not hiding behind the curtain so to speak. I cannot wait for your next magic so i will bookmark this now. My next Magic, eh? Not sure if I can live up to that pal. Bigger companies require more in-depth reviews. Recommend me and I’ll dive in for you. I would love to work with the Uber team, their values synchronize with mine and I love their working culture but I called them before but they were full last year. Anyways, appreciate the kind words and feedback bro, thanks for dropping by and have a great Friday! I still have yet to try Uber mainly because of the case where that Uber drive killed them people after he picked them up. Although it does have quite the earning potential according to the commercials I see about it. Are these commercials true in regards of how much a person could actually earn or is there more to it. Is there a catch like there is with so many other side jobs? There’s no catch Jason, it’s free forever because Uber earns from your sales too. There are bad news everywhere in every country but that doesn’t mean everyone’s bad. Nice review on uber and tons of great information on uber and how to become a uber driver and I wonder if the rules are the same here in the US. And I like your website good luck! The rules are similar Hunter, but since the US is a lot larger, one state is as big as a country so instead of one main HQ nationwide, they have their HQs in every state. Thanks for dropping by! Hi Riaz, thanks a lot for the info,learn much more from it . I would like to ask do u ever drive uber black? Would it better earning? Currently, I driving uber x ,thinking of upgrade to black but don’t have black cars, do u have any sources to rent it? I have try few contacts that u given but they said they didn’t provide. Tq. And of course, Mudah still works too. Ok. Thanks a lot for the info. Just found your web site. Thank You for sharing all of this valuable information about Uber in Malaysia., I had been a passenger in Uber in both the states and Panama. Had very good experience in all of my rides. However, I did not know how Uber worked from the employee side. You have spent a lot of effort and time in educating us and for that I thank you! Glad you found my article helpful Clyde, I too use Uber whenever I travel abroad as well, not just in Malaysia. Have a great weekend! I have several friends and family members who drive for Uber and they all seem to enjoy doing it. I have been thinking about joining myself but I’ve had so many questions about it. All of the information in this post was incredibly helpful, and I honestly think you answered all off my questions. Thank you for all of this information. I found the pros and cons section to be quite helpful! Anytime Laetyn, it is kind of enjoying when you get to meet A, B, C-list stars, everyone takes Uber and we’ll definitely get a chance to meet them. 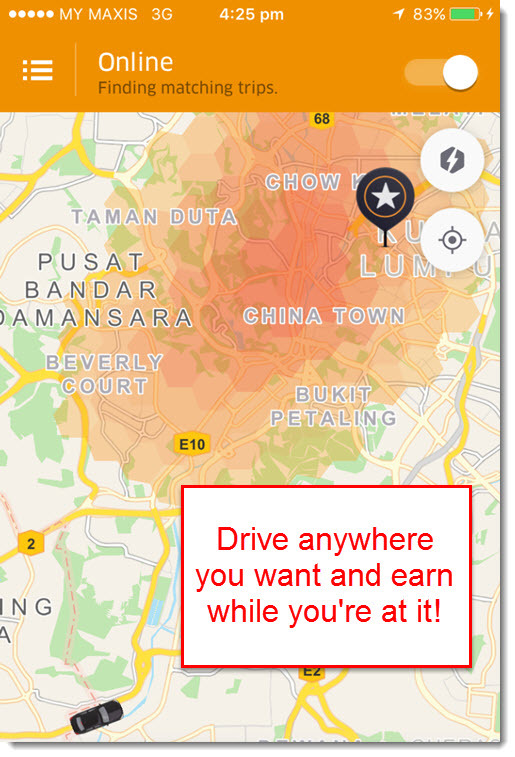 Wow very in-depth post about how to become an Uber driver in Malaysia. I never imagined they had branched out from the U.S. but you proved me wrong. Do you worry about certain passengers maybe not having the best of intentions toward you or does Uber have safe guards in place to help mitigate that? Uber safeguards us by collecting a rider’s details before he or she hops in our car and setting up some rules. If the rider disobeys, he or she will get blacklisted and can never use it again and Uber will also make it viral in news so that others will know what that rider did so there’s nothing to worry about. Good question, hope I answered it right man, thank you for the kind words! Thanks for posting such a thorough review of earning money with Uber. I’ve thought about giving it a try but never followed up with it. Now I have a much better understanding of how it works. I’ve used Uber as a passenger but now I might more realistically consider being a driver. Awesome to hear that Matt, you’ll definitely love becoming a Uber driver. Good luck! Your post is very informative and comprehensive! Freelancing by driving has become popular these few years and it is a good way to supplement income. I have known many people who have lost their jobs due to the economic downturn and then switch to driving and managed to make a living from that. Your review of Uber driving definitely provides a lot of relevant information for a lot of people, so thanks for this! Glad you liked my article Moon, we are facing quite a difficult time now thanks now the world leaders. Have a great weekend! Your website is so interesting about how to work as a Uber driver. Incidentally, I’ve been thinking about buying a car for uber business but I don’t have enough information on how it all works out. You have tackled about this issue in depth and I love the way you have explained every point in details. Something I have been asking myself and you have answered very well is how the drivers get paid and how the calculations are done. This article is very informative and I wouild bookmark it for future reference. I do not come from anywhere near Malaysia but I think the Uber operation is almost the same globally. Uber although has different calculations on every country, share the same system. The only thing they do differently is the strategy on whether or not it’ll work with the locals. Glad I could brief you in on the details, appreciate the feedback! Does Uber offer any perks for their drivers. I use Uber all the time in America and was curious if they give any discounts. For example if I drove on New years eve the surge prices are through the roof to attract more drivers to drive. I think that a driver who provides so many rides at a time like this say 5 should be awarded like a discount or something. Maybe only have to pay a base rate next time they ride uber during surge prices. Kind of just speculating here but what do you think about them doing something like that? Another thought that I had was in regards to the ratings of both the driver and the customer. So as far as I know both the driver and passenger have the ability to leave reviews on each other. Is it possible in busy areas to pair the higher rated drivers and passenger together and then work down the list. Therefore there really is a bonus to receiving a good rating. How do you think that could work? I think you need to take your first Uber ride first to know what its all about, go ahead and try. They do promotions a lot and sometimes rides are free for the first $5 just like that! As I’ve mentioned, surges are the reason for the price hike because you being in the middle of peak hour in the middle of the city, you’ll bound to be hit by the surge. Without question this article is the most thorough review of Uber that I have seen anywhere and done by anyone. I hired a Uber driver last summer needing a ride to the airport for a trip I was taking. This individual backed up what you stated about the ability to earn more $$$ within a specific time frame during any single day when she stated that she has a lot of fares in the early morning hours, (she picked me up around 6:30 am) as many people contracted out as Uber drivers are simply too lazy to get up and work in those early hours. Also I was unaware of the rule in Malayasia in which you stated that a car can only be 5 years old to qualify and any vehicle older than that has to go through an inspection process. In the U.S. I believe that the limit extends up to 10 years and anything older than that is not accepted under any circumstances. I don’t know how the economy is in Malaysia but I do know, based on what the one person who drove me stated as she is retired in her mid-60s she makes incredible wages – again her being willing to work early morning hours. 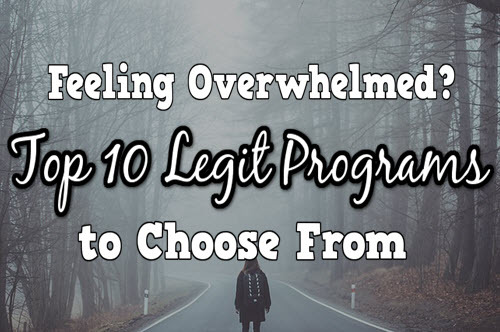 I also agree about what I feel is the one really bad negative about the program. That being the fact that some riders are just plain disrespectful in treating the car itself with dignity by not leaving a mess behind when reaching their destination. In the U.S. with cost of gas prices down considerably compared to a few years ago, it’s not such a negative with the fact that a Uber driver is responsible for his/her own gas. Back in 2012 or so? It would have been a big deal! Again your review of Uber was incredibly comprehensive based on the amount of research you had to have done before writing the article! Taking a morning drive is one of the best parts as there’s cool air in the morning and people are generally in a good mood as they are just starting work. And its true that people are too lazy to work around that time, for though if I’m serious about something I would work on it morning till night and sleep properly around 6 hours a day so that I’ll have enough energy to go for it the next day. Actually 5 years as I mentioned is only on paper here. Older cars can qualify definitely but you’l have to go through inspection and as over here our accident rate is quite high compare to the USA so we’re taking extra precautionary steps to keep the riders safe. Regarding the fuel though, we have it pretty cheap here but lately the price hike is killing the drivers. Drivers are going to leave unless Uber jacks up their price for 2017. Thanks for the super awesome feedback man, you blew me away with your comment! Hope you have a great Wednesday! Wow, you wrote such detailed post on Uber here. I’ve never actually use Uber as a driver before, only as a passenger, through your review though, I see that’s a great way to quickly make some money on the go. It’s much better than being a taxi driver in that you don’t actually have to commit and you can work on your own terms, it’s even a nice way to make some new friends. 🙂 The Uber drivers I know are pretty cool. Its definitely nice to drive and meet new people, you never know who you’ll meet. Some are unpleasant but most of the time the people you meet are gonna give you a positive impact on your life. Always a pleasure to have you here, hope you have a great day and thanks for dropping by! Thanks for this info! I’ve been wondering about Ubers fees and whether there is a levy for car and fuel costs – do you think that being an Uber driver is worth the cost and time? Also didn’t realise there were car requirments, probably explains why I haven’t seen any vintage 70’s mean machine Uber cars ha. Old cars can join Kegan, they just need to pass their performance inspection as I’ve mentioned. My family and I actually used Uber when back in Manchester over Xmas and I must say the service was great.I actually wish I could join Uber but from 2014 Uber had to cease trading activities within Spain due to the taxi drivers protesting.Since then I have never give it a thought but now reading your review I am going to look into it again. Taxi drivers are not just protesting in Spain, its happening all over the world and in some countries which are a bit strict, they want to preserve their taxi so not all countries accept Uber. Manchester is beautiful, I love it there so great be talking to a local! Appreciate the feedback, thanks for dropping by! In Indonesia we have similar online taxis but using motorcycle, but the fare not quite high like Uber, and they dont have the surge price. Yes I do know of the motorcycle ride sharing app Friedrich, we have it here too in Malaysia. Glad you liked the article, much appreciated. Hey there…. I am really happy for your detailed review about Uber in Malaysia. I am a student, last year was riding uber taxi to get some pocket money and Uber was pretty new in Nairobi ”Kenya” but let me tell you something….These guys have totally spoiled the industry! They came with low prices to the point that the small amount of money you get out of it can’t really help you. I gave up on the Uber idea, maybe it’s not the same in every country but in Kenya it’s only beneficial for passengers who use it! Its not the same in every country Armstrong, but I have indeed start to feel your pain. It was awesome in Malaysia but they keep decreasing the price that commissions are getting lower. Hopefully they’ll increase the price again after the recent fuel hike. Fantsatic and much Luck to You on your new endeavor!! Every area of interest was covered and not in just a well informed way(first hand experience) but also with humor and obviously a very knowledgeable author. Describing the way in which a person is compensated and the way in which they can earn 2x’s as much was easily understood. I absolutely love Uber and I love how you decided to write a review on them. This post is the perfect example for people interested in working for them or even just learning more on how Uber operates. 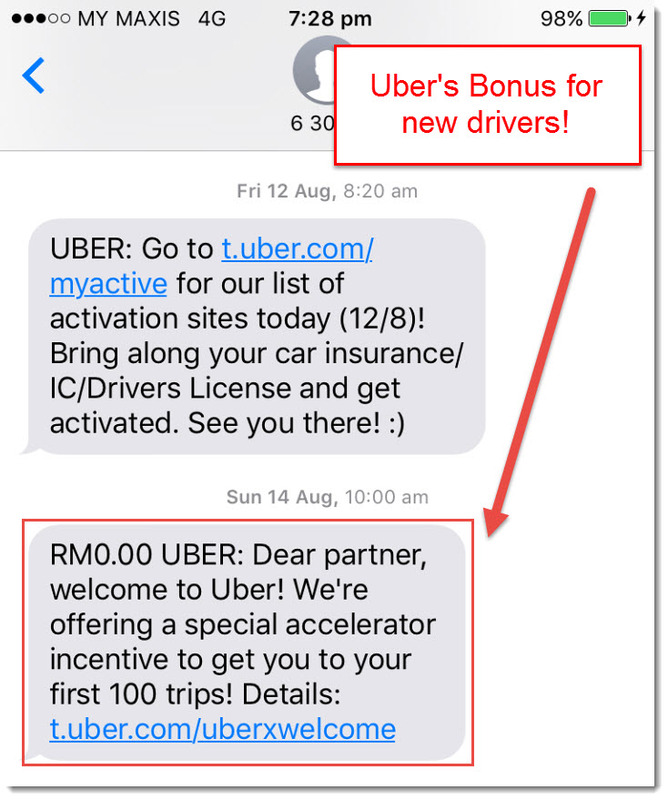 I never knew you could earn with Uber just by referring others. Nice piece of info there, but I’m even more fascinated by the formula of how Uber drivers take their share. I’ve always tried researching that, but could never find a straight answer. Thanks for providing one of the most in-depth reviews of Uber I’ve ever seen. Amazing job. Great to see an awesome company like this become prevalent on an international level! I also find it pretty awesome how Uber exploded in growth in such a short period of time, Peter. Not worry about the review, I guess its about time someone write it as detailed as this one right? Thanks for dropping by, much appreciated! Play guitar while driving? Next to impossible to pull that off since we have to focus on so many things at once – Driving, navigation on Waze and talking to passengers. Good idea nevertheless, thanks for the feedback! Uber is indeed helping the lower and middle class like us get added income, glad to know that I managed to help you out. Super impressed with this post, I legit never understood the concept of Uber before, how it works, how to sign up, and you answered all my questions. My favorite part was how you played out the pros and cons of uber driving, and it actually seems like a pretty good gig, in terms of part time pay. Thanks for the post. 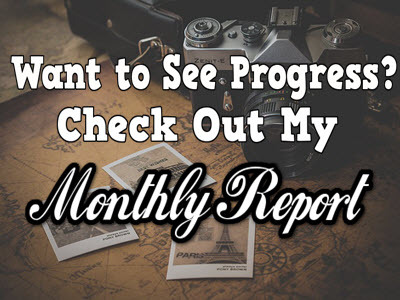 That’s my aim JP, I try to write my reviews as detailed as possible so that my readers don’t have to go elsewhere to find info on the same topic. Appreciate the feedback, cheers! I am not from Malaysia, but I am sure some of the same questions apply to me in the United States. I need to earn some extra income. How much on average can I expect to make from Uber driving? I live outside a city in the suberbs…so its not exactly urban with a lot of people. But, plenty of people I think. How many drives can I expect to do in a day? Or, does it matter what location I am in? Thanks for all the helpful information. MSB. In the USA, you can actually ask the drivers themselves on whether or not your area has good demands. If it doesn’t, not to worry! You can still drive like normal from your point to the city area where there are loads more demand and along the way, just go online and you’ll be sure to pick up passengers as you go. As for the how many drives, that depends on you. How many do you want to pick up? Some passengers would want to go as far as the airport while others may want you to just send them to the mall. You can’t know where they want to go so when it comes to driving, everything is up to you as you are free to drive whichever time you want. Their sign-up procedure is a lot more rigorous than I expected, especially the 5 year criteria. Maybe I have a warped view because of the economy in my country but if I were able to afford a car that new, I wouldn’t need an income like this. But at the same time, I understand how much of a liability it is to trust that your drivers can safely transport passengers. go ahead and check out his Instagram, he has over 90k followers! Actually if you can afford a car, its better to go on ahead and Uber up because where you’re from, cars are much cheaper as compared to where I’m from. Here in Malaysia, cars are taxed 300% more and don’t bother asking about how expensive it is in Singapore. You guys got it easy bro. Very well thought off and written article. Well done Riaz. Eager myself to earn some extra income doing what I like – driving of course. Just a bit concern on the wear and tear aspect that’s giving me 2nd thoughts. Ever been threatened by cab drivers? What is your advise to avoid confrontations with them? You seemed like a nice bloke bro. Plus very good with your article. You’re not a writer with any of the newspaper companies are you? Haha I wish I was with some newspaper company bro, but no this is my blog and I write because of my passion for writing. As a matter of fact, I do have some disturbances by taxi drivers, you know how gangster these guys are. My advice is to not linger after you drop someone, just continue driving after you drop and stop only if you want to pick passengers up. Thanks for the kind words man, Happy Chinese New Year ! I’ve always wondered about Uber as a way of making additionsl money – here in London they have done really well although I’ve never known how to go about applying. I’m guessing it is the same process worldwide? There is so much info on here, you have made the process really clear and also weighed up the pros and cons really well, Thank you! This is very interesting. I reside in South Africa and we also use Uber but I never knew you can refer drivers and earn commission. I would simply put an advert up locally for “drivers needed” list all the requirements and when they apply I would just refer them to Uber. Can it work this way? I would not become a driver as I work full-time+ but this is certainly a great opportunity for younger people or in a cash emergency like you mentioned, if they pay out weekly. It would also be interesting if you actually blogged on your individual trips, that would be an interesting read. Tell us about those grumpy people, what you encounter during driving people around in Malaysia. Thanks for sharing, will look into this opportunity on our side of the world. I can’t really give you a definitive answer on that as I’ve never tried it before though. And about the grumpy passengers, its the same old annoying passengers who treat you like low class servants and complain if you drive too slow, if you arrive late, or even if you are no sure where exactly the destination is. Glad you liked the review, thanks for dropping by! For quite sometime I have been thinking about driving for uber or lyft but there has been some concerns. One being I don’t want to put the mileage on my car so I thought about purchasing a car (volt) specifically for driving for uber or lyft and my other concern is getting enough rides to make it worth my wild! Most of the basic information you have provided here is useful to my final decision but because I am driving in the US I obviously can’t compare earning but in your opinion is RM300 a day good earning for 12 hours driving in Malaysia? Our currency is very much like your currency is the US whereby even with RM1 we can buy stuff, unlike other countries where huge numbers can buy you one thing because of the value in currency. RM300 a day is great, imagine you having USD300 a day in your country, pretty cool isn’t it? The Volt is definitely going to be an awesome investment for you man, you’d save a ton on fuel! Almost half of our profit will go to petrol so imagine you having double income just because your car run solely on electricity! Awesome investment man, can’t wait to see how that happens here. Thanks for dropping by, Happy Chinese New Year from Malaysia! I love his work. He has affiliate link for Wealthy Affiliate primary and he is very detailed in Uber facts, figures, income possibilities, et al. He makes it so comprehensive from the compensation plans, to the mileage, uses pros and cons and get into cars to look for. The entire page layout is “moving” in that there are maps, diagrams, charts, photos and more. An awesome job. He is one I am going to reference when doing reviews for now on as its an authority site readers will believe it! Thank you Kathleen, I’d appreciate that. I came back as the other day I was here looking at some information on SEO. Do you remember? Well, I loved what you are doing here so wanted to see what else you had up your sleeve. I have heard of this service Uber before but to be honest I was not really in the know of what it was all about. Looking at it though it does look like a good opportunity for people to make some money with the use of their personal vehicle. It is like most opportunities though, there is always an outlay. The mileage you put on your car will eventually cost you money with servicing and other areas of attention, and the fact they take 25% of your earnings is a little steep. While you do make cash immediately, I think in the long term you would end up spending more with the upkeep of your car and the use of petrol. Am I right? Or a little off the mark? On a second note, and off subject, i just want to say well done. You are really doing some great and educational work here and i learn a lot every time i visit. Of course I remember, you’re one of the frequent visitors here and I love your work on Greece’s history that you cover on your site. You’re definitely right on the outlay though, the maintenance is a bit pricey and for my car for example, I pay around a thousand bucks for every 100,000km so seeing that it’ll take a year for me to reach that number, its worth it if you keep driving more. I guess as a retired person who has a car that will qualify as an Uber Black the rates look great. Although as you say the 25% to Uber sounds very high as they are not paying petrol etc. I am not living very far from you I guess, one causeway and I am in Malaysia. 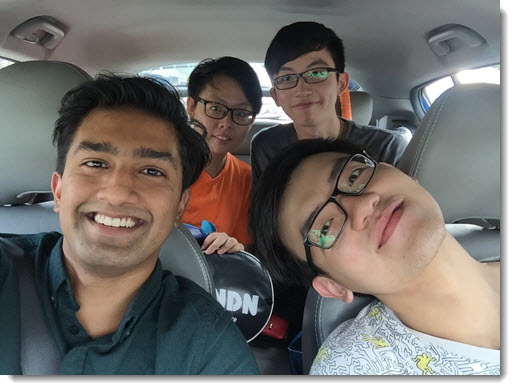 I have thought of driving Uber because you know owning a car in Singapore is very expensive and Uber is a good solution to reduce the expenses on car ownership here. The regulation in is pretty close to here in Singapore except the prices are much higher. Prices are indeed much higher in Singapore dollars but if we see it from a local’s point of view, its not all that bad. You guys just have to get through the expensive car requirement problems and with some dedication, you’ll definitely get through. Happy Chinese New Year Vincent! Great info, I had thought about being a Uber driver in the US, Its probably a lot of the same here. I like that you have a lot of pictures also. I believe you have given enough information for anyone to decide about whether they want to work for them or not. 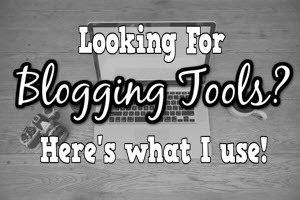 Me personally, I don’t like a long blog roll, but you seam to have enough info at the beginning. Good to know that Karen, thanks for the feedback. Hello Riaz, I have thought about being an Uber driver in the US and this site has gave me some perspective. I have worked jobs that I had to use my car and I just really don’t want the wear and tear. The info here is great. hope you get a lot lot of active visitors. The wear and tear is really a let down, isn’t it? One of the reasons why its not for everyone but I’m glad my article helped gave you some perspective on how Uber works. Thanks for dropping by! Interesting post. this would be a good thing to do in conjunction with Wealthy Affiliate while you are building up your online business. Building an online business takes a while to build up but it also takes a lot of mind power. Many jobs are two distracting and require too much focus, but Uber driving would be a good compliment. If you’re interested in doing a guest post for me on supporting your Internet Business with Uber let me know. I’m debzo on WA. Many jobs take a lot of energy and attention but Uber is actually very relaxing. Sure driving takes up energy and attention, but you don’t have to spend hours writing documents, all you do is drive and watch the scenery while talking to your passengers. I had never really understood how the whole Uber process worked. Really important to understand if you want to become a driver. I know there have been many legal disputes about Uber – it’s interesting to learn that the Malaysian government now holds a stake. I’m sure you get to meet lots of great people! Thanks for the post. Yes I did, thanks Amy! Whoa! Your review is mind-blowing! I wasn’t even aware that Uber was offered in Malaysia. I was considering becoming a driver in my country, but I was kind of on the fence about it. You’ve TOTALLY convinced me! As extensive as your review is, I just have one question. I might’ve missed it, but what exactly does RMO stand for? That’s awesome news Noody! Glad I’ve managed to convince you, do let me know if you need more advice on things you’re facing as you go. Actually I don’t recall ever saying RM0 though, which part do you mean? This is really the most comprehensive review that I’ve seen in my life! It is very well structured and explained in detail. I always wondered how Uber is functioning and you give me all answers that I need. I rest my case and no further questions! Thanks Dan, glad you liked the review. Have a great Tuesday! Fun part time job! Do you need to know Malay in order to drive Uber in Malaysia? 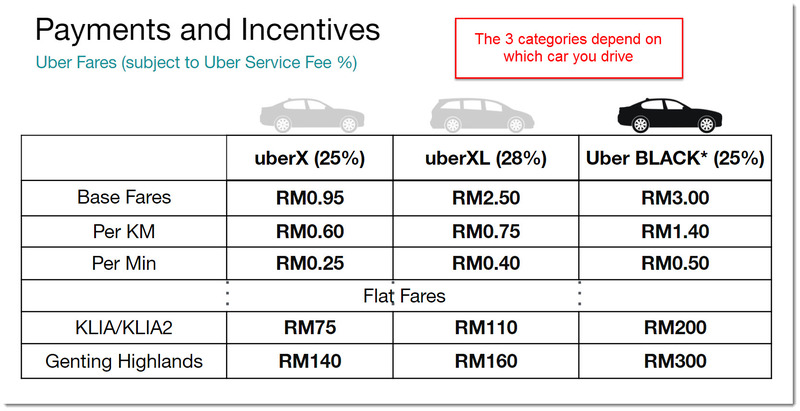 Malaysians mostly own cars so Uber there is a very easy option. I love it that you earn money plus meet interesting and famous people. Plus the potential for even more income from those you meet. If riders like a particular driver, can they choose? The insurance bit is actually very important though. I’ve come across car accidents involving Uber drivers in the news. To have insurance coverage gives more security. You don’t need to know Malay in order to drive Uber though it does help because eventually, you’ll end up picking up passengers who doesn’t speak english. I get a lot of passengers like this even in urban cities like Puchong and Ampang so knowing how to converse in the national language helps. Awesome questions there, hope I managed to help answer your curiosities! Hope you have a great Monday! I really love you review on Uber and I love Uber, I use it a lot. I al ways wondered how working for Uber really worked and you did a great job giving information on this wonderful company. The problem for working for Uber is great, however, I must say I never really considered the dons, which you perfectly explained in your post. What I also found very interesting is the Uber service Malaysia. Where is that Exactly? Malaysia is huge, what do you mean by where exactly in Malaysia? I have listed locations in maps all around my article, you just need to read. I’m glad you liked the article, thanks for dropping by. I like the where you added “you mat get to meet celebrities!” Might be rare, but it certainly is true! I never knew what “Uber Black” was, so thank you for this article! I wonder who would get paid a bit more just to be driven around in a fancier car. It’s good to see that Uber drivers get the commission during the surge price times. Awesome to know you liked the review Alex, you too can meet celebrities with Uber. Appreciate the feedback! Hi Riaz, you gave a very elaborate insight of how Uber works, so now I know how this works. I am living 170 km from Bangkok, but I am not yet aware that Uber has a presence here. I take it that they would built in a meter in your car? I also wonder, if anybody can enlist, how they take care to get good and safe drivers. Greetings from Malaysia! I love Thailand, very beautiful country and I frequently use Uber there as my mode of transportation and it works well. The only drawback is that its very hard to speak with the locals as most of the drivers do not speak English well so they only depend on Waze. Uber already has a meter in their app so No, they don;t build a meter in your car like a taxi – All you need to drive is your phone as all calculations are done there. 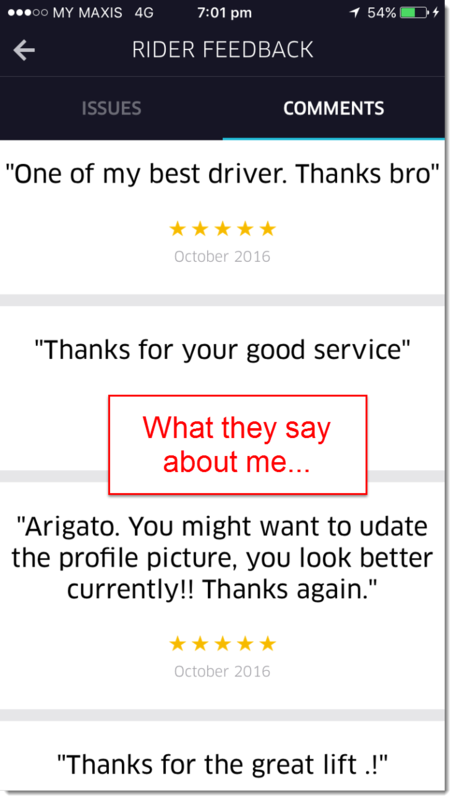 I have spoken to so many drivers when I have taken a ride with the app, and they generally seem satisfied with the way the system works. I was certainly surprised when I found out I had taken over 100 rides last year, so it is an effective way to travel. wow 100 rides? If you were to take at least $10 trips on average, that would mean that you’v spent 1k already on transportation alone! But seeing that its for the whole year, that’s actually very cost saving as compared to having a car. You really covered everything I could think of, answered a lot of questions I have pondered, and explained the process very nicely! The pay scale, bonuses, and rush hour times are in good detail! And the pics of your passengers mde me feel more personal. Great job! I really like that you touched on the pronunciation, very interesting! I think you’re the only one who noticed the pronunciation part Elisha, but I’m glad you found the article helpful to your burning questions. Thanks for dropping by, wishing you a great Thursday! This is an amazing article and very enlightening about the way people travel daily in small motor vehicles as opposed to buses, trains, etc. This appears to be a good way to earn income, either full-time or part-time. It also sounds to be a very busy lifestyle, especially with maintaining vehicles to a high standard. You mentioned that some people are not clean, therefore greater attention needs to be given to the interior of the vehicles. You also mention Uber being in many countries. I haven’t experienced it New Zealand but no doubt a search on the web will provide the necessary information. Thank you for an enjoyable read and teaching me about a mode of transport I was not aware of. Uber is definitely up in New Zealand, especially in popular cities like Christchurch and Auckland. And its definitely a busy lifestyle as you said which is why its not for everyone but if you can stand it, there’s good money to be made. Thanks for dropping by! Wow Uber really is a great opportunity. I was not aware that you could earn so much. Would it be worth doing full time if you had a great vehicle and a good mechanic friend? I like driving so this would be a great job for me. Thank you for all the information. It is greatly appreciated. That would be an awesome combination Keith, you don’t have to worry about your car much and all you need to do is drive. Definitely worth doing full time! I’m an Uber driver here in the US, and I must say, that driving Uber has been a great experience thus far. If anyone is looking for a simple way to earn some extra income, I have to say that Uber is an excellent choice. How is driving for Uber in Malaysia overall? I tend to deal with low fares all of the time. And I desperately desire to make more. What’s been your experience thus far? I tend to deal with low fares all the time too Christian, you just need to invest your time and position your care in a middle of a surge area and when the time comes, go online and drive like there’s no tomorrow! You can manage to earn double or triple just like that. Hi this is really informative. In fact I am overwhelmed by the information! But I am not living in Malaysia. Infect I am from your little neighboring red dot, Singapore! . Just want to share about my recent trip to Kuala Lumpur the capital of Malaysia. I got charged exorbitantly by the taxis. After which I tried using uber and I managed to get a ride at half the price! To add to this, the driver was so friendly and was able to tell us which shops to avoid and which shops are trusted. Thus uber drivers to be, it definitely helps if you know your area well and can provide tips to tourist to encourage a stronger usage of uber! So good to hear that Leody! Uber is a great form of medium for interacting with locals when you’re in another country though, I use it myself when I’m abroad to get me o right places without getting overcharged. Thanks for dropping by, have a fantastic Tuesday! Hey there! I’ve heard some pretty crazy stories from people who were passengers using uber. With that said, in order to become an uber driver, do they require a background check? I would feel much safer knowing that my driver, if I were to use uber, had a clean record, driving, criminally, etc. Otherwise I agree, if you enjoy driving and want some extra cash, it seems like a great opportunity! They certainly did Shay, and you’ll be testifying to them too that you’re not at all a criminal with no drug records. The drivers are all working very hard too, its a great community where everyone’s nice and the environment is regulated. Hey Riaz, great post! I am a big fan of Uber as well. This is very fast growing business and I always wanted to know how big is uber’s fee. Also, the information about car age was very helpful, now I know that I cannot use my old car. Do you know maybe what is the legal status of Uber in Malaysia? Rafa, everything’s in the article. As i mentioned, fee is 25%, old cars can still be used there is a way, and its legal. Good day. After reading what the guy said, I too feel you resemble Shahrukh Khan! I’m sure the guy must have been really entertaining. Uber is really becoming a way to make money in metros and this article is a must-read for anyone who wants to earn some extra money. This was so well written, I have no regrets following your posts! You’re too kind Shrey, you actually made look back at my photos to see myself lol. Awesome to hear you liked the article, thanks for dropping by! I always thought being an Uber driver would be great experience with not too many drawbacks. Your pros and cons list showed me that I was wrong. It’s a great thing you put this in here – it gives anyone considering being an uber driver some insight. I had no idea Uber Select even existed, despite living in America. Overall, if you have the right car, it seems like a good investment. Thanks Alex, I try to give the best detail when I can to help my readers decide better. Cheers! Your niche is spot on! Earning more money is a huge interests in many viewers online today and uber driving is a fantastic way of making some extra money. How thourough you were in your content is stunning! Way to cover every aspect your viewers will really appreciate the work you put in. And fantastic use of visuals to keep the viewers engaged. Keep up the good work! Awesome to hear you liked my review Stephen! Cheers! It’s great that Uber is expanding to different places. It sounds like a great way to make extra income. Your review is so detailed and thourough. I love the cons, it actually sounds like fun. Especially the part about meeting interesting people. The surges sounds like a great incentive. The one thing that concerns me is the not knowing of destinations until the pick ups. Just wondering…Do these rules apply (universally) to Ubers all over? Also, do they give incentives for driving in bad weather? Just wondered, hey, thanks for this awesome review and how to get started. I’ve learned a lot. Hey Bev, you mean to say that you like the pros right, and not the cons? Its universally that you can’t see where you passengers are going and this is because Uber doesn’t want its drivers to be picky. Thanks for dropping by, have a great Friday! LoL, right…I meant to say I like the pros. Thanks for answering my question. 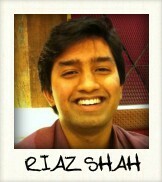 You have a great one too, Riaz, take care. Thanks for this great info on Uber. My wife and I have actually been talking about trying it out for some additional money. I was always interested to what the commission was because sometimes it seems like our drivers were spending 20-25 minutes for a $9 trip. I was thinking it was more like 50% commission but 25% is much more reasonable. If its a 20 minutes ride, it would cost at least $15-$18 depending on the time Jeremy, don’t worry. It’ll be a great experience for you and your wife and if you have one car, you could take turn and make your car into an asset. Good luck! 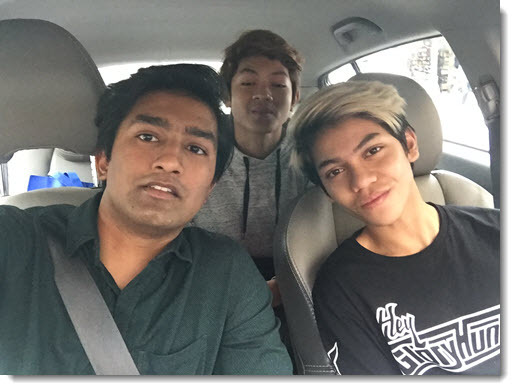 Hi Riza, Are Uber drivers taking business from taxi services? Why does your car have to be within 5 years, to drive for Uber? How much wear, and tear does driving for Uber do to your car? What is Sunway Lagoon? Does the rating the passenger give you affect your uber driving record? Do you need to change your insurance policy to a higher coverage? Does Uber pay on Tuesday the same way for all countries? How many countries is Uber in? First off, my name is Riaz NOT riza, Get that straight. 1) Why does your car have to be within 5 years, to drive for Uber? – Uber wants us to use new cars instead of old ones because they may cause problems. 2) How much wear, and tear does driving for Uber do to your car? -That depends on how far you drive, and whether or now are you planning to drive everyday. 3) What is Sunway Lagoon? -It is a theme park here in Malaysia. Google it. 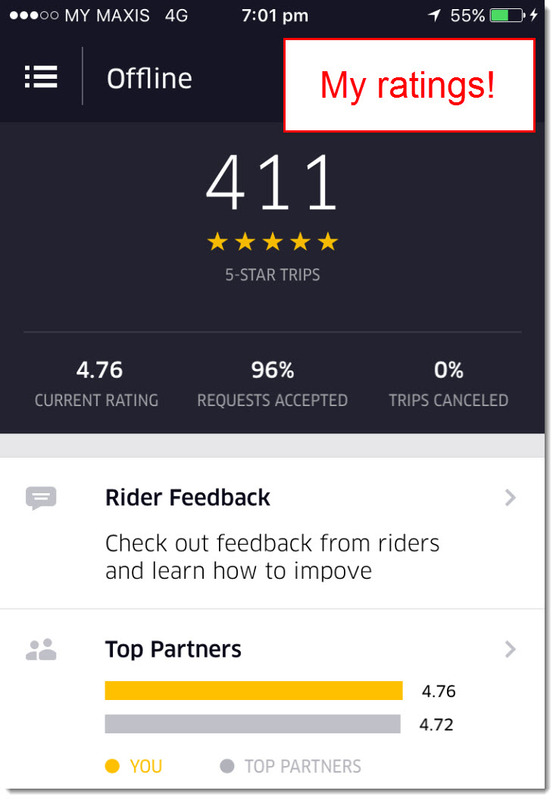 4) Does the rating the passenger give you affect your uber driving record? -Yes it does, I’ve mentioned this in the article. 5) Do you need to change your insurance policy to a higher coverage? -No, you don’t. 6) Does Uber pay on Tuesday the same way for all countries? -Also, I’m not sure because this review is for Malaysia. 7) How many countries is Uber in? -66. I get that you are curious Larry, but before you ask obvious questions, read my article. Good day. Wow what an amazing in depth review about uber! I had no idea there was so much to know about the company. I know a few friends that use it and it helps them bring in extra cash while they have a full time job. I like how recently they just started allowing you to buy cars from them that way you don’t have to wear down your own personal vehicle . Have you ever bought a car from them, or are you thinking about doing it in the future? A lot of people now do what your friend is doing, we have a full time job and we do this to get extra income too. Living costs are getting higher. I haven’t thought of buying a car from them because actually, I like using my own car because at least it makes me feel better that I could get some money out of the car investment. You could think of it as an asset though, at least not all your money were spend without getting any in return. Glad you liked the article, cheers! 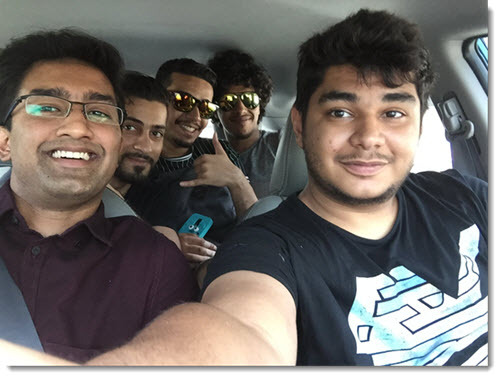 Brilliant post about Uber, I like this company so much now Uber everywhere, I live in Qatar may be I will try to check out hot to become an Uber driver in Qatar, but really your article is so interesting to me & your stories too I am sure that you got a lot of experience from this adventure, I hope I can do it one day, Thanks Riaz for this post & keep up the good articles. You definitely can Ehab, Uber is up and running in Qatar and is revamping their system for 2017. I’m glad I was able to inspire you to try out Uber, do let me know how it goes for you. Good luck! Incredibly detailed review, you have covered pretty much every questions anyone would have about becoming an Uber driver in Malaysia. It’s actually a much more interesting topic that I thought it was going to be! You obviously know your subject matter very well and I like that you have included personal relevance. Glad you liked my article Sarah, I try to be as detailed and personal as I can. Cheers! I really enjoyed learning the insights of being an Uber driver. It seems quite lucrative if you want to simply drive with passengers and get out and about. It must be interesting to chat with riders. It must be like being your own boss. Thank you for sharing your experiences. It is Alan, that’s why they call us drivepreneurs although I don’t entirely agree on it, It does feel nice being able to work when we want and earn whenever we feel like it. Meeting awesome people is a plus too! Wow. There is certainly a lot to consider when thinking of becoming an Uber driver and it seems like it can offer the potential for someone to earn extra cash. There are downsides, as you point out, but there are also lots of positives and I can certainly see why it appeals to so many. I also likes the way Uber scrapped their hourly guarantee, and introduced surge pricing, so that it was fair to drivers in the morning rush hour. This shows that Uber are trying to work with their drivers. And it also seems to offer a very flexible working approach and the opportunity to meet lots of interesting people. Driving for a living is not for everybody, but I am sure it will appeal to many. Totally agree with you Daniel, that peak hour guarantee let’s us get more flexibility. Uber is awesome but with the increasing fuel price, I only hope they increase their fare price as well. Appreciate the feedback, hope you have a great Tuesday! I always wanted to read up on a driver’s experience with this country and coming across your honest report of the working as you have seen it happen is really refreshing! Thanks for the in-depth look at this service and how it works for you. I will be checking out the US version, do you have any information on this service there? I don’t have any info on the condition of Uber for partners in the US Shawn, I’d love to write about it since its the birthplace of the company itself but Uber made it clear that only people from their own countries can become drivers. Glad you liked he review though, thanks and hope you have a great day! 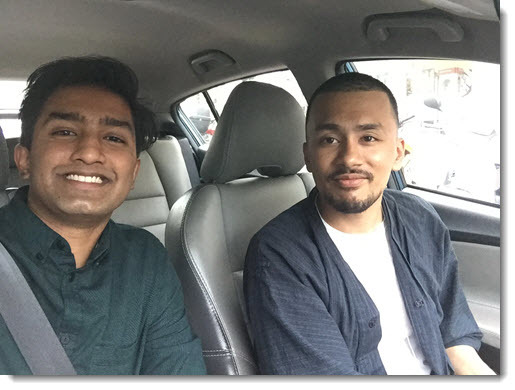 I really enjoyed your site about becoming an Uber driver in Malaysia. Your site has a lot of great information about Uber, they way it is operated,and how you can make money off of it. I had no idea that Uber has become as popular as it has, but it totally makes sense in more populated areas of the world. I like your honesty about your life and that you are open that you turned to Uber and the internet to make money because of financial difficulties. I think you did very well adding your pictures and blogs, great job. I wish you all the best with your internet business and I hope you don’t get anyone on your Uber travels that totally destroys your car. haha..
Nope, no experience with people like that but if they do, you could complain to Uber and they’ll recompensate. I have a love hate relationship with Uber LOL. My dad recently came to visit me and we flew to Seattle for the weekend so he could see a dr there. Well, we used Uber several times and you know how that works. Our Uber bills should have been around $130. My credit card showed a bill of over $400. I had over 10 charges of $26 every time we used Uber, on top of the fee I paid. Well, you cannot call them, you cannot email them. I am also a driver too, but have been doing nothing with them since this! You can’t email them but you can actually can call them up. I had the same case when I was riding and a passenger, my bill went up to 10 bucks more when it should so after calling Uber, they adjusted back the charges for me. For the driver side, I once had a passenger who didn’t want to pay me because she didn’t have cash and Uber topped up their money to balance it out. Lots of details in your well-written article. It is really well explained. I also enjoyed very much the photos at the end. It must really be a nice experience getting to know so many people that way. I’m a Uber fan more than ever now! Are there any angry reactions from local taxi drivers? Do you know if a foreigner living there (with regular visa, work permit, etc.) can still become a driver. Are there any restrictions? Unfortunately, foreigners cannot become drivers. As I mentioned in my article, only nationalities specific to their countries can become Uber drivers and yes, taxi drivers all over the world are angry at this and not just in Malaysia. Glad you liked my article, cheers! 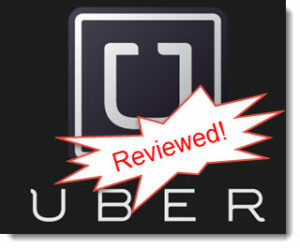 You have provided a fantastic review on Uber. Though I’m from your neighbouring country, Singapore but most of the things that you mentioned are probably applicable here as well. I actually did consider driving for Uber over here in Singapore but there are two things holding me back. One is the high cost of car ownership over here as you probably know and the other is the competition from taxi where there are at least 20, 000 taxis plying the roads every day for a small population of 5million people. However, if I take advantage of the surge that you mention in your review, it may still be worth my while. Any comments on that. Thanks and have a good day. Awesome to meet a fellow neighbour here, I love Singapore but haven’t been there since last year due to our currency going down hard. For the car ownership, actually you can try to strike a deal with your friend who has a car and give him royalty for part of the money your earn so he’ll agree. Once you’ve got that down, all you need to do is to drive through the surges and see if the demand in Singapore is as high as they say. It should be as foreigners prefer to use Uber, its the same case here too in Malaysia. Hope that helps, have a great Monday! Wow, this is very well written and detailed article on how to become an Uber driver. You have really covered everything. Seems like a good way to make some extra cash. Do you know anything of how well this works in Europe? I know there has been some trouble concerning Uber here in Europe as traditional Taxi drivers has taken Uber to court, claiming that their activities are illegal. How is it in Malaysia? Its not just in Europe but in all other countries as well. Most countries in Europe are okay with Uber as its a more conventional way of hitching a ride without having to go out of the building and stop nearby taxis but for some countries like Greece and Latvia, they are not okay with Uber and prefers taxis. It depends on which country you are from and any country that Uber is operating, you don;t have to worry much because if they are there, that means they are legal because if not, they would have been chased out already. You should also post an Article of Taxi Driver vs Uber Driver in KL lol. Many Taxi Driver do not use taxi meter and eventually turning people off. Now Uber arrive and give way better service and at cheaper rate too to their customer, now many Taxi Driver said that Uber destroy their business lol. True that Arthur, and not just KL at that. Its happening all over the world but I’ll definitely be writing about that pretty soon, thanks for the suggestion! that’s really good information about Uber that I frankly I’ve have been curious about but never knew. I stay in Singapore and have still been taking conventional taxis. I may just stand to. I’m glad to stumble upon your page which I should say is very comprehensive. Interesting to learn that Uber far exceeds Grab in growth in Malaysia. But the concern is not for Grab but I wonder what will happen to conventional taxi companies not only in Malaysia but all over the world. the taxi are all facing the same problems not just in Malaysia but everywhere in the world. They cannot drive without meters anymore so they cannot charge stupendously high anymore too. In a way that’s good but some of those drivers are really gansgta that they resort to harassing Uber and Grab drivers instead. Awesome to meet a neighbour, hope to hear from you again soon! Appreciate your feedback man, cheers! There’s no negotitation on the fees David, the Uber management set it up that way and I wish they would reconsider. Glad you liked my article! What a profound peace of information! I think it covers all of the points anybody would wish to know about Uber. To be honest – this is the first time I hear about Uber, here in Latvia (my country) we have Taxify – I guess it is something similar to Uber, as you also use your car to drive passengers you get through Taxify app. It is getting more and more popular here, but from the comments I can see that Uber is popular worldwide. Strange I haven’t heard about it before. Latvia’s a cool country Arta, I’ve always wanted to go there one day, its one of my getaway places end of this year. I’ve heard of Taxify but unfortunately, its not in Malasyia yet so I can’t do a review about it yet here. Thanks for dropping by! Fantastic and comprehensive guide with lots of detail. I live in Switzerland and I don’t think Uber is here yet. 25% does seem a bit steep but then again they are also playing their part in making it all possible. I didn’t realise you could do it and a full time job at the same time. Its’s not a lot but when you have a lot to pay and when compared to Uber’s competitors, it does play a role, Switzerland is awesome, the last time I was there I never took Uber but hoping could try it out soon! Thanks for dropping by, cheers! Apa khabar? I’m from Brunei. Wow, it seems to me you really are having a great time both online and offline which is on the road and event management. Your side profession is indeed adventurous, not just literally bringing people around and about but as well as meeting well-known individuals. I just wish you all the best and happy new year! Jom, kita pergi! So awesome to meet a neighbour, how is Uber going along in Brunei by the way? Happy New Year to you too! Thanks Barbara, some passengers are indeed very demanding and you have nothing to do but to abide by them so its best if we can have the motivation to do that in the first place. Glad you liked my article, hope you have a great day! I know that here in the U.S. Uber is making a huge dent in the taxi services that for decades have controlled the industry as far as providing people rides for money. I rode with a person who drove for Uber several months ago needing a ride to the airport. The woman had a brand new and expensive SUV and I rode in style – something that would not have happened had I hired a yellow taxi cab service. It also was not quite as expensive either. I also know of a friend who allows her teenage high school daughter along with her friends to use Uber when she needs to travel somewhere – the daughter also has her driver’s license but prefers to ride with Uber. The mother makes the daughter pay for the fare as well. I have never been to Malaysia and am unfamiliar with how Uber might work as far as passengers being respectful to the people who own and drive their cars. Judging by what you stated there could be a problem with passengers being disrespectful towards the vehicle itself – you stated the need to sometimes clean up after a passenger has left. Having written a review of Uber myself I have always highly recommended it for college students who qualify as safe drivers and cars that would be acceptable by the company as a way to earn money quickly. I wanted to ask if in Malaysia do they pre-qualify all perspective contractor employees as being safe drivers with no bad accidents, traffic citations and the like? In the U.S. Uber is very strict about who they hire to drive people. Great review on what I feel is a completely legit manner for a person to earn money driving for Uber. Yes, I agree that the person would never become rich in this venture. But often in many cases any extra bit of money can help a lot of people. In Malaysia I would say that its not as strict as it is in the US because they have a problem where the demand is too high and there are not many drivers to go around, It used to be a but strict to join but now they’ve lessen the bar requirements to be a driver. Wow amazing feedback there, thanks so much for sharing your point of view. I really appreciate that and I wish you a very Happy New Year! Hi Riaz I am blessed to land on your page. You have helped know and understand Uber. I’m from Uganda and heard about Uber but quite get till now. Its indeed an awesome business opportunity now that you insightfully explain it. I wonder though if time came to join and were to consider you as my referrer, how would it work both our benefit. You can simply join from my link and continue the rest of the registration process in your end of the country. Although the process might be a bit different, in my end it will still be the same and we can still contact each other like normal. But of course its better to join a community because drivers take care of each other as taxi drivers will soon be a problem. Hope that helps, let me know if you need help with anything. Good luck! Awesome to hear that, I’ve always wanted to go to Capetown and knowing Uber is doing well there, I guess I already know what kind of transportation will I be depending on. Glad you liked my article, Happy New Year! Your post is really pack with information and stories. I like it, As A (capital A), lol Uber drive myself, I actually hardly gain enough ROI to cover all my cost. I also drive uber part time. But when they started to introduce the selection which we could set our final destination and only receive request to the same route, it helps a lot. And yeah, meeting people when driving is one of the best thing about being uber partner.I think I should drive more often! Actually if you catch the surges, then the ROI should be more than enough because without the surge, its not worth chasing because the time wasted versus the amount you earn is barely enough. Awesome to know you liked my article, hope you have a great Thursday! I’ve always wanted to try Uber and try to make some extra cash. I love driving and have a perfect driving record so it would be a great match for me. My car is a 2 door sports car. Also after doing some research I found out that my area doesn’t have Uber yet. 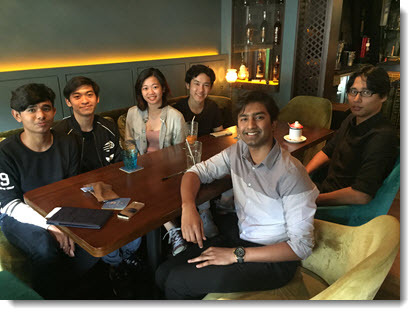 Thanks Riaz for sharing on Uber and its activities. I think its a great opportunity for people who have cars and are being underutilized or do not have regular jobs. This can be a means of earning income from their cars anytime they want to. There are those who also have challenges to even fuel their cars or service it for their own personal use. This service could be a way to supplement their income also. Thanks so much for sharing. Quite right Bonto, the recent fuel hike is unbearable and I drive sometimes just to make some extra cash to cover the maintenance and fuel costs. Thanks Brandon, it is a great form of transportation isn’t it? Awesome way to connect with the locals too, saves money for tour guides. Happy New Year by the way, appreciate the feedback! Uber has been in Canada for at least 2 to 3 years and it seems as though the public are really responding to it. I agree, it’s a great way to earn some side money but personally, I don’t see it as a full-time opportunity since it will probably wear down my car. it was very interesting for me to learn some details about how Uber works, if you decide to become a driver. I live in Italy and I used Uber several times as passenger, since they were much cheaper than taxis and more flexible than buses. I have to talk in the past because unfortunately the service was suppressed about 18 months ago by the taxi lobby, because the business for taxis collapsed dramatically after the arrival of Uber. I remember the courtesy and enthusiasm of the Uber drivers, who were very happy to earn some money in a relatively easy way. It’s all over now. I wouldn’t say Malaysia’s public transportation is better, if that is so we wouldn’t have to rely on Uber much lol. But I can say that improvements are on the way what with the new central train stations that recently opened. Love your review Riaz. So detailed and comprehensive. I also like the fact that you actually share your experiences and don’t suggest something you don’t really know of. I have used uber for transportation on my travels in Europe(i reside in Greece). Really good company and service. Never considered though to work for them and make money from it. Thanks for the idea. May consider it if uber becomes available in Greece. Do you know anything about that? Uber is very much active in Greece already, but your government has made a very firm decision that no private drivers are allowed. Because of that, Uber uses taxi drivers so there’s not much different in price but somehow, I have heard stories of regular people (Not professional drivers) driving Uber and they have a lower cost at that too. It’s worth checking out and its very interesting to know how people fight for their right to earn. Awesome question, I hope it answered you well, Happy New Year and thanks for dropping by man! Hi Riaz, thank you for an excellent article on Uber. Driving for Uber is certainly good to make some extra income but I agree with you about it not being a full-time thing unless I don’t have another job. But KL traffic (if I remember it correctly) can be quite bad.. Is the 25 cents per minute worth it? And does Uber take a 25% on that as well? I guess if you have nice passengers in the car, then maybe its ok la… but if I got a grumpy passenger in the middle of rushing, it will be quite painful I guess? Anyway, I guess people can sign up and see la. As I understand it, you don’t have to drive if you don’t want to right? Uber won’t penalise you and take away your license to drive for them if you only drive like 3 hours in a month right? As I mentioned on my article, Uber takes 25% fee but when it comes to the surge, they do not touch that extra boost you made and yes, its worth getting stuck in traffic jams especially when it comes to surges because 25 cents can become double or triple that amount. I didn’t even know the Uber was available in Malaysia that is amazing.. Apparently they are everywhere. I knew they were here in the US because I have friends that do that to make extra money during the year when they have extra expenses arise. Brilliant idea on a website! Even I do Uber from time to time for the extra cash when the need arises, like for New Year and Christmas when we tend to overspend like nobody’s business because of all those awesome goods and sales. Appreciate the kind feedback, thanks and hope you have a great New Year! Your article here is awesome for anyone wanting to be an Uber driver, even if not living in Malaysia. I had heard you have to have a newer car, but less than 5 years old seems so crazy. I have seen well-taken care of vehicles older than that. I guess it would be concerning about the wear and tear on your vehicle and if the compensation from Uber covers the cost properly. In the short term, it seems like a great way to gather some income. In the long term, I would wonder if the maintenance on the vehicles is worth it. Happy New Year Kerri, thanks for dropping by! Damn! This article is a gem for anyone thinking of becoming an Uber Driver in Malaysia. I was completely oblivious to many of the things that you explained here. Your article was a lengthy one yet it didn’t bore me a little, it was clearly written and well laid. My uncle had some queries about the same topic and hence I researching about it, I landed on your post and I’m happy because it finally seems that all of my uncle’s questions are answered here. Thanks a lot for the article. Cheers! Awesome to hear that, man! Which country are you from by the way? I may be able to help get some more useful info for your uncle. Thanks for the great feedback, Happy New Year! I congratulate you on this Awesome review. I’ve never read such a detailed review on Uber. You came on every all detail of this system. Great job. I agree with you that uber is a very nice option for increasing your income. And the best part of it is that you can work whenever you want and rest whenever you want. No obligations, no minimum working hours, nothing. When yoy want to work just open that app and you are ready to go. I just have a question for. You said that to be accepted your car shouldn’t be more than 5 years old. So if someone starst say with a new car, does that mean that he should renew his car 5 years later or what? Not more than 5 years old, less than 5 years old. New cars are the best, everyone loves them but old cars sound like trouble and there are certain cases whereby the driver had to ask the passenger to call another uber request because of car issue. Hope that helped clear the air, Happy New Year! I did not know about the types of uber vehicles that there is. I am starting to convince myself of becoming an uber drive. Thanks for the article is very complete. Thanks Jt, which country are you from by the way. Uber is expanding rapidly into so many countries its amazing. Uber has moved into the market as the way to earn cash for people I know here in the US. I never would have imagined Uber in Malaysia! But I guess Uber truly is everywhere. Like you said, its not a full time thing. I’ve seen my friends wear themselves and their vehicle down. Uber is a great opportunity that can lead to even greater things! Definitely a wear for the car in the long run, driving full day should cover a few hundred km already right? Uber is not truly everywhere yet but they are growing very rapidly recently. Appreciate the feedback, thanks for dropping by! Read your review andbit’s awesome! I’ve signed up both Uber and Grab..but til now i haven’t started driving either one yet. But after reading your review helped me overcome my nervousness a lot. I’ve been in the retail line for more than 25 years,and i met people of all walks of life throughout my time..I quit bcoz age is catching up(i’m 51 by the way) and retail line is no way i’m gonna have some extra time in hand for my family..if you get what i mean.So,i can’t go without a job too,right? That’s the reason why i signed up Uber and Grab as so to keep the ?coming in. Anyway,your words enlightened me man..and i think i’ve gotta start somewhere. Appreciate if you can share a video or somethin’ of your first “customer” on your first day.What did you say,how you greeted him/her,how was it during the ride ect..
That’s an awesome idea and I understand about the first customer part. I was extremely nervous too even though meeting people is quite normal for me. I guess it’s because since it’s the first time, anything can happen but just take a deep breath and drive. Everything will be fine trust me. Good luck and safe drive!